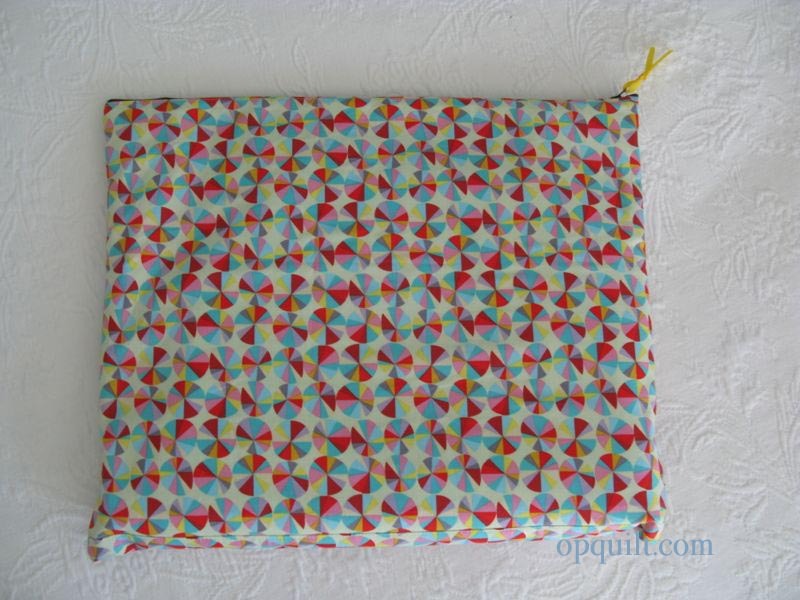 Quilting and Sewing Project | OccasionalPiece--Quilt! 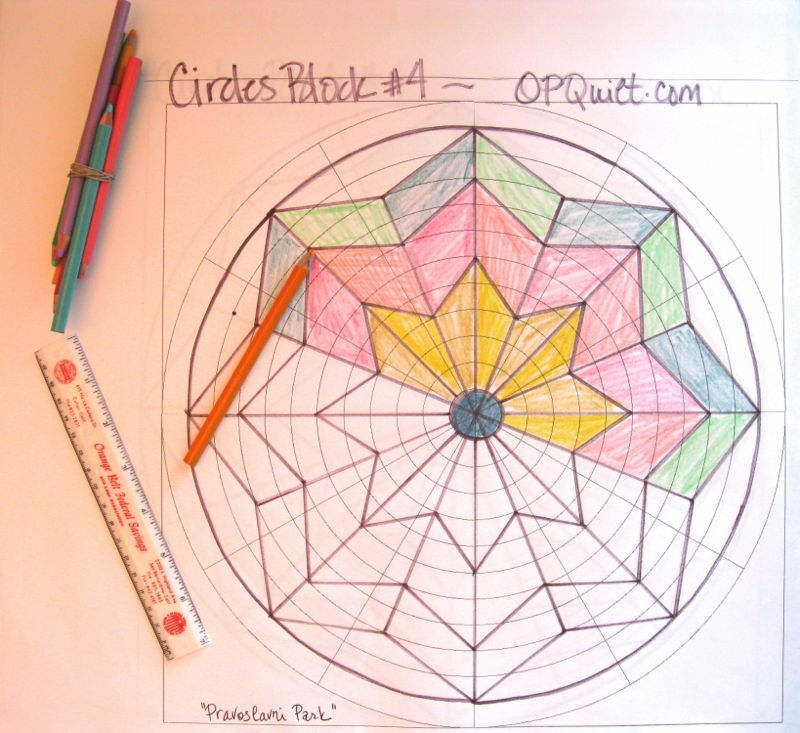 Posted on September 28, 2014 by Elizabeth E.
Now that my daughter’s three young children are all in grade school, she decided it was time that she went back to school and study her favorite subject: Interior Design. 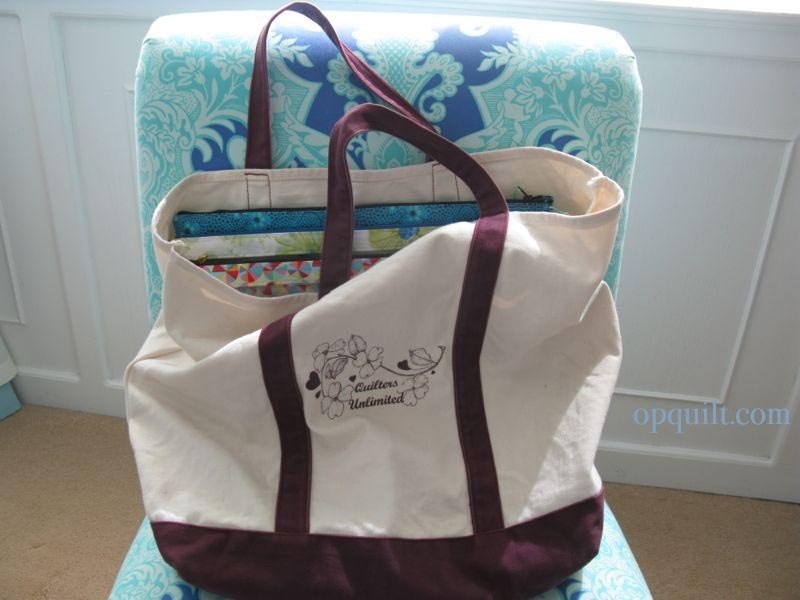 She sent me these three pictures with the request: “Can you make me a bag to hold my drafting tools?” I’m on it, Barbara. I fused fusible fleece to the outside bag fabric, then cut the interior lining and set them both aside. She needed a protected place for her drawing leads, so I sewed a block of fabric onto bag front piece, and sewed the pocket into segments. 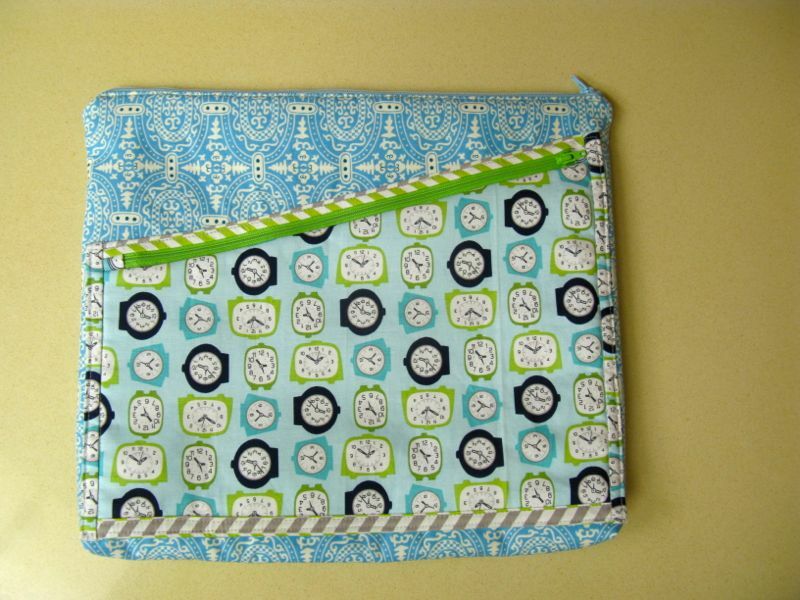 Then I created an outside flap (the clock fabric). I cut it on a slant and fused it to (again) fusible fleece. 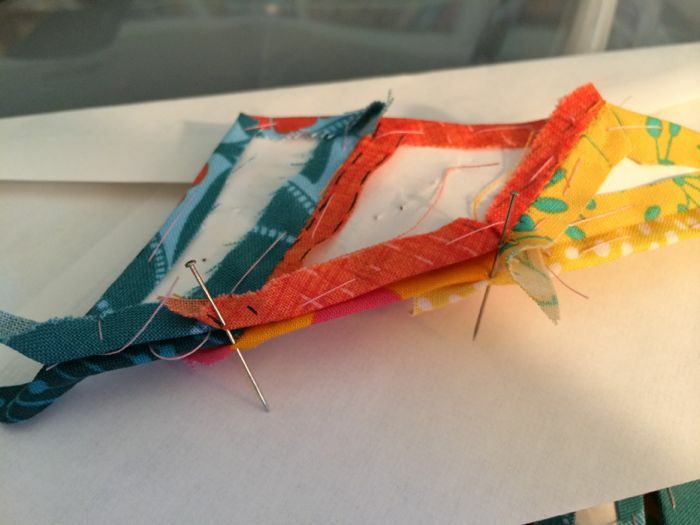 I inserted a zipper in between the clock fabric and the lining, then bound all the edges, including the exposed edge of the other side of the zipper. 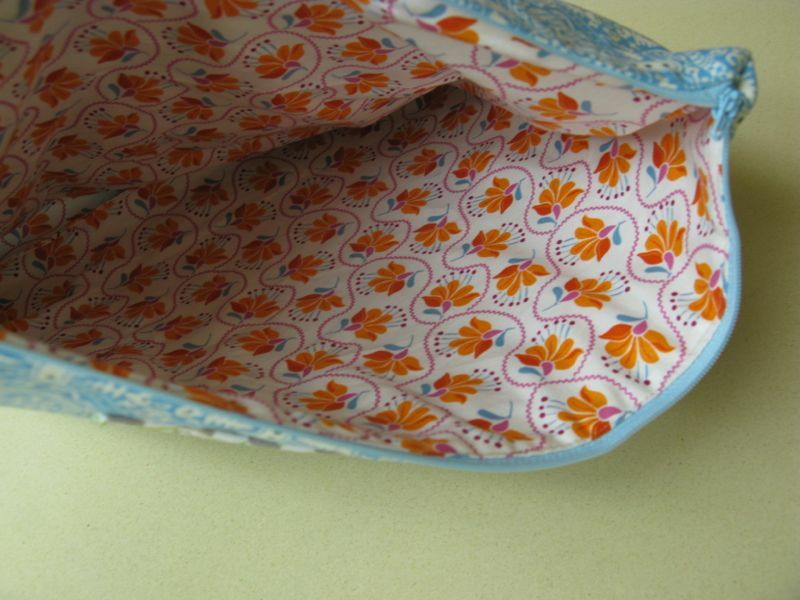 Then I sewed it on, covering that flowered pocket piece. This also is place she could put papers, or her magnifying glass, or whatever else. After sewing in a zipper at the top edges, then sewing up the sides and bottom, I boxed the corners to give a little bit of space inside. Last, I put a handle on the back side, in case this is deep inside her backpack and she needs to grab it out in a hurry. Hope it works, Barbara! Happy Studying! 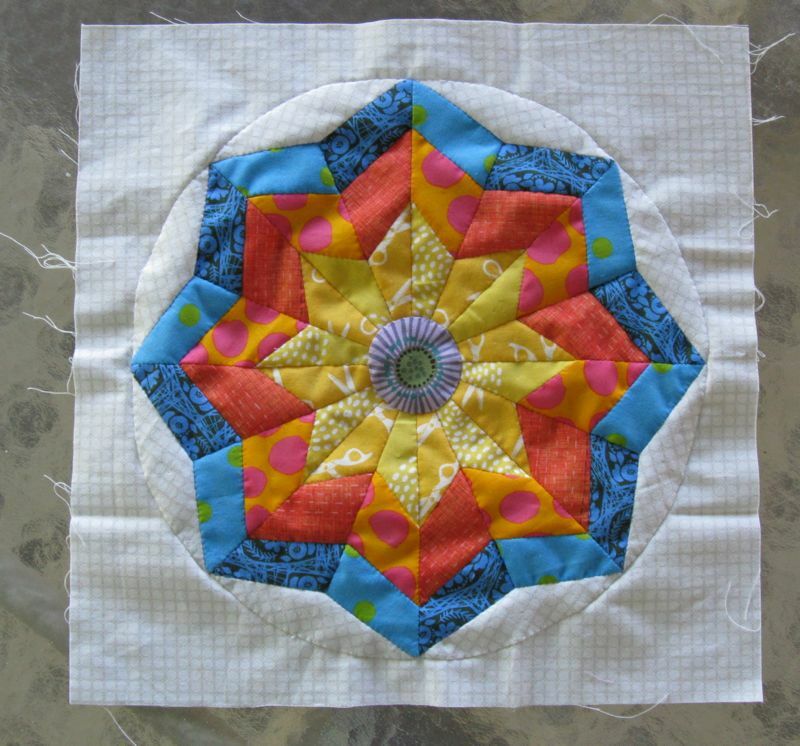 Coming up at the first of the month: English Paper Piecing Sew-Along, Circles Block #5. Posted on September 1, 2014 by Elizabeth E.
Here they are all together, all different, but they play nicely together, I think. I was asked about color selection for my blocks. 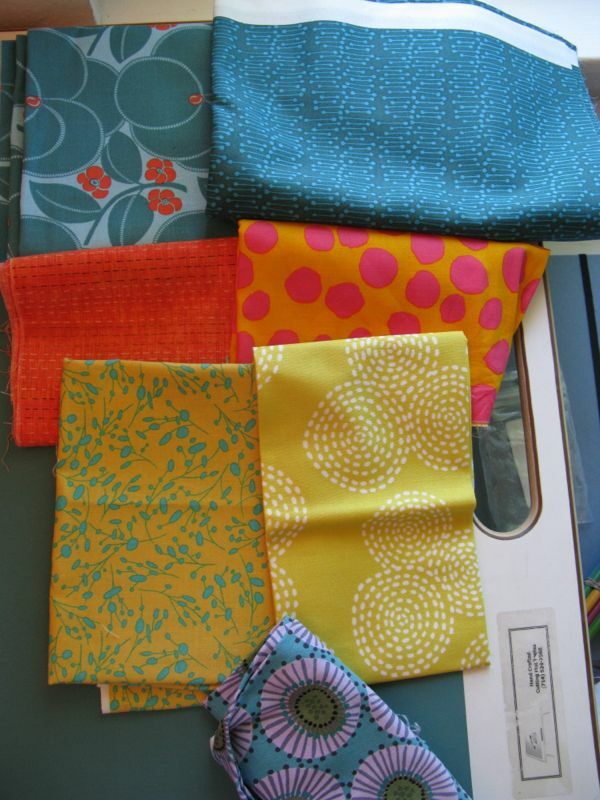 I have to admit I just have chosen my favorite fabrics from my stash. I do keep in mind that they need to coordinate, but I also know that the repetition of this circular shape would also tie the blocks together. The upper left is not really that dark (see above); I’m just taking the picture with the late afternoon sun and it makes the left side of the photo darker. 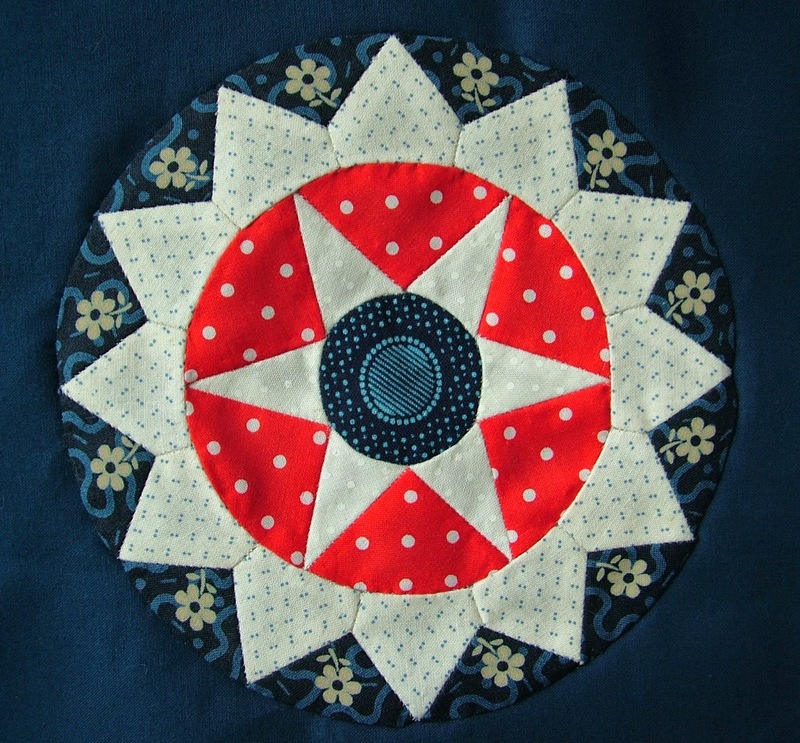 Like I said, this Circle Block is an eight-pointed star, and I again used the technique of making the circle by English Paper Piecing (EPP) but appliquéing it onto a 14 – 1/2″ square. 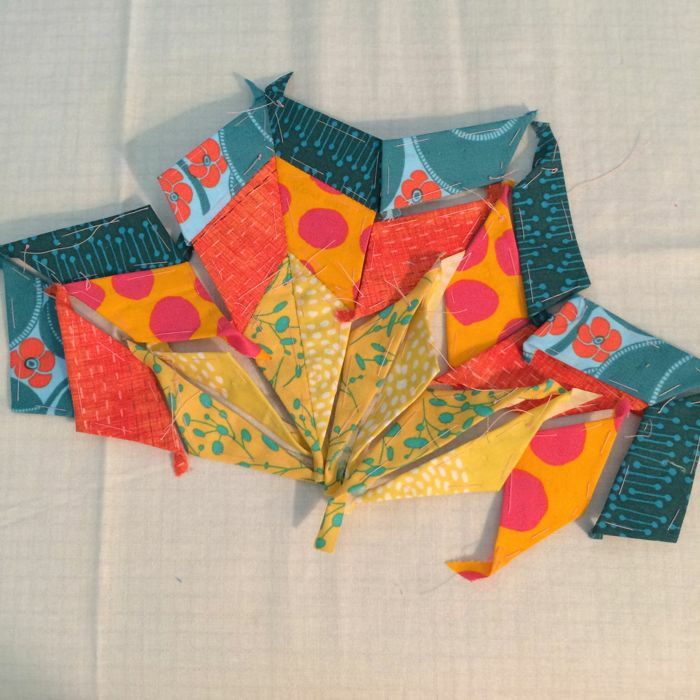 Click here to download the pattern for the pieces: EPP #4. I do spend a lot of time on these, so please do attribute the source of this to Elizabeth at OccasionalPiece-Quilt (or OPQuilt.com) and do not print off copies for your mother or your friends. Please direct them here to get their free copies. Many thanks. 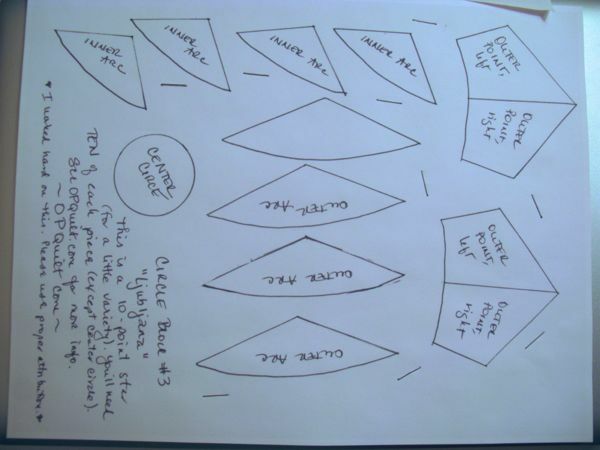 As before, print out enough copies so you can make your eight-pointed star, then staple them all together heavily so you can cut them out without them shifting. Again, if the pieces have no direction (are the same shape if folded along an axis line), lay them with the printing either up or down. 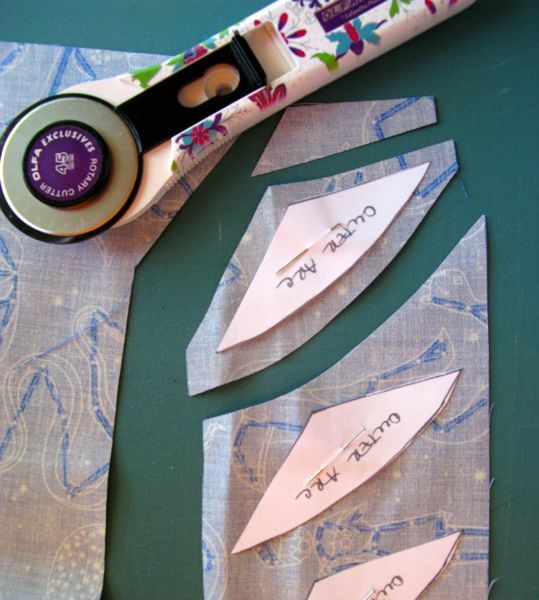 If they are specific, like the point-pieces, lay them out on your fabric with the printed side facing the wrong side of the fabric, and then cut them out. Sometimes if I whack off too big of a seam allowance, I’ll trim it later as I’m basting around it. It’s all very forgiving, so don’t stress. There are more tips and instructions on Circles #3, Ljubljana. The inspiration for this block came from a combination of the two above blocks. 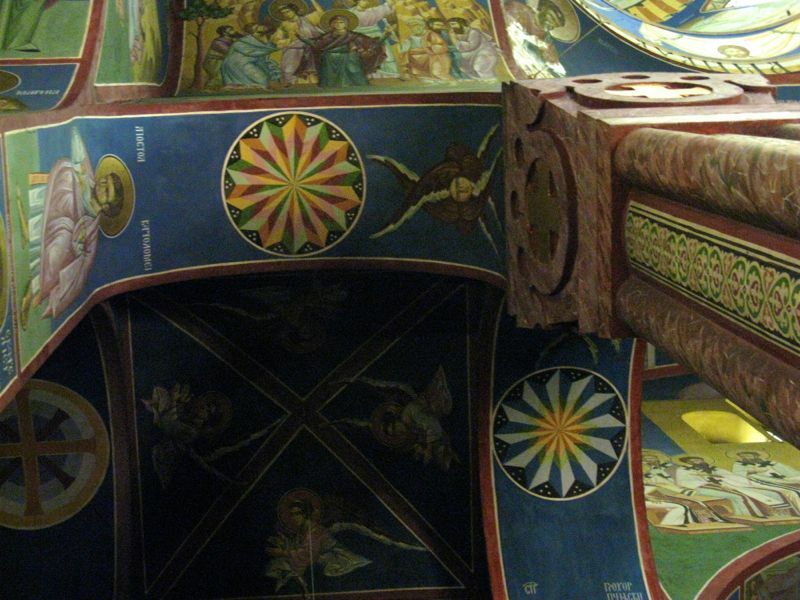 I wanted fewer points than are shown in the church paintings but I did like the division or the “layers” of points. Again, these circles are high above floor level, so they are a bit hard to capture in a photograph. 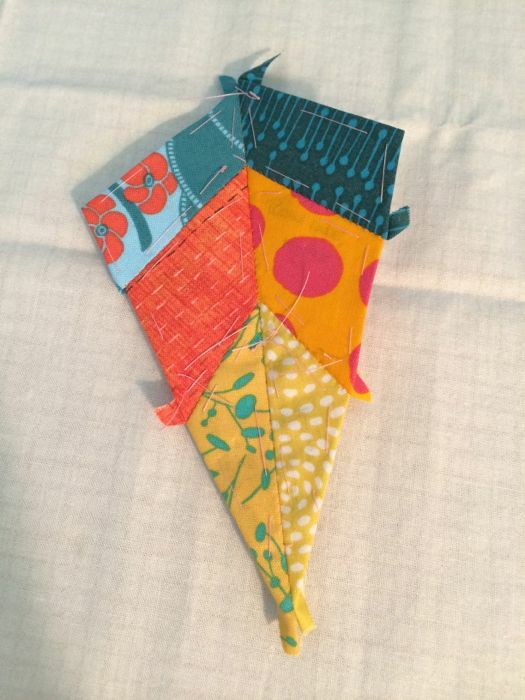 All three sections joined together, the left side and the right side done separately. 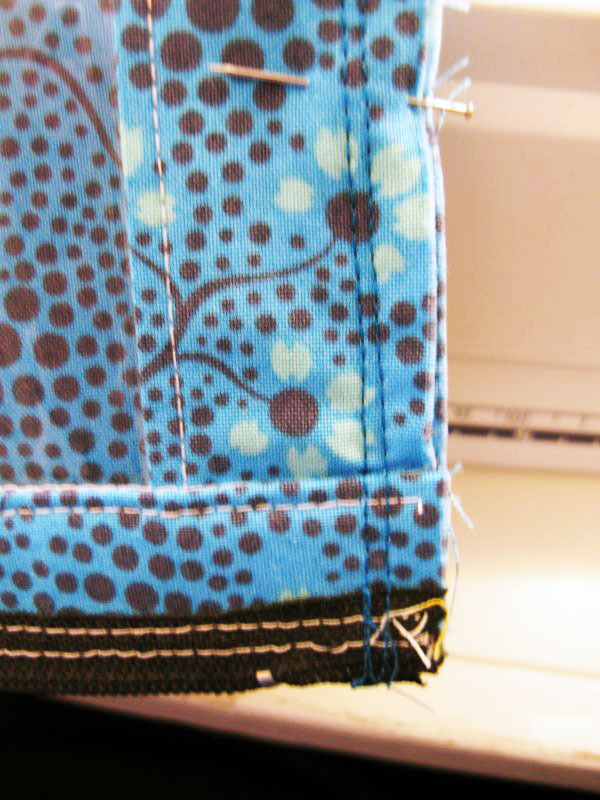 I put pins in the joining seams to keep them aligned as I sew. 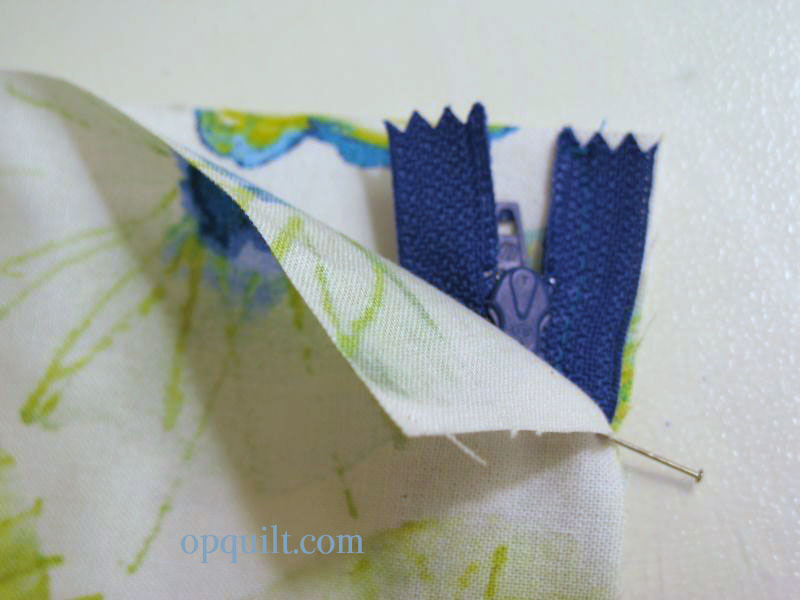 I located the tip of the paper inside my basted piece and started sewing them together from the bottom, matching that teensy end first. This is when I had one done. I laid out all the pieces to see if I liked it. I didn’t. I had started in the usual way,with the fabrics like this, trying to lay them out as I think they will work in the design. It looked okay as laid out, but after I finished one, I didn’t like it at all. I brought out more fabrics. I liked this better, but I kept trying. 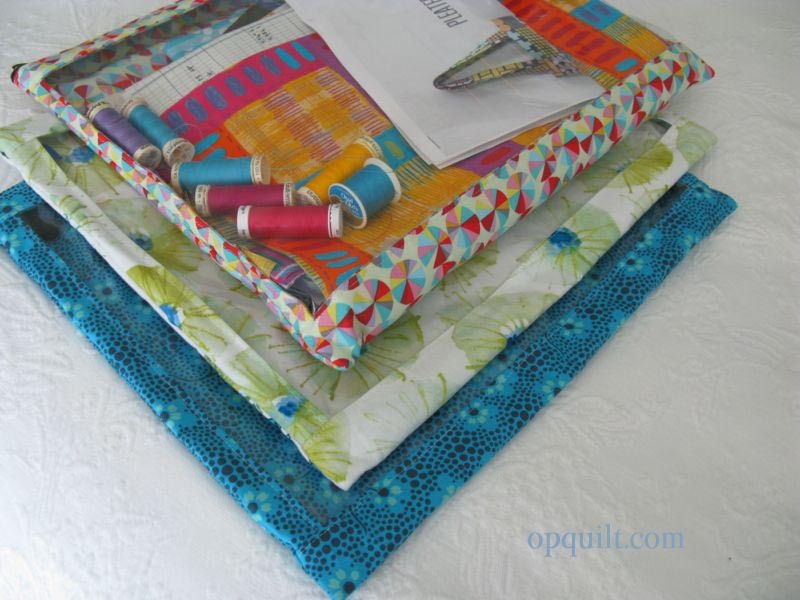 As usual, I try not to obsess too much about perfection in design and color and pattern and all those other things we quilters worry about. 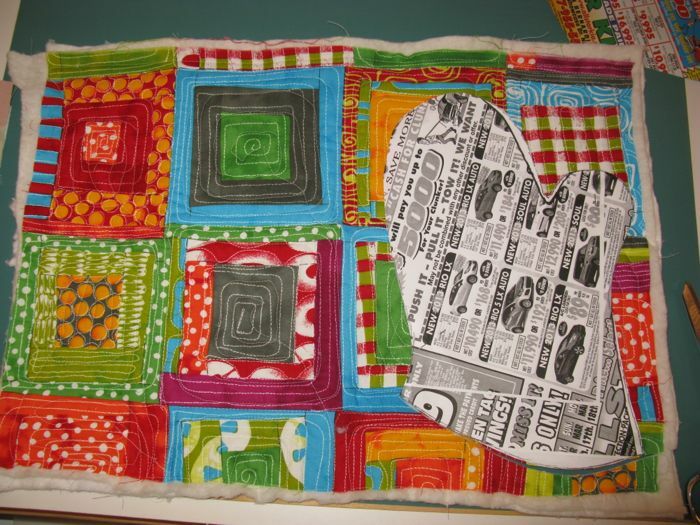 Scrap quilts can sometimes boggle our minds as they don’t fit together as easily as those ones we make from one line of fabric, that line of fabrics perfectly keyed to work together. 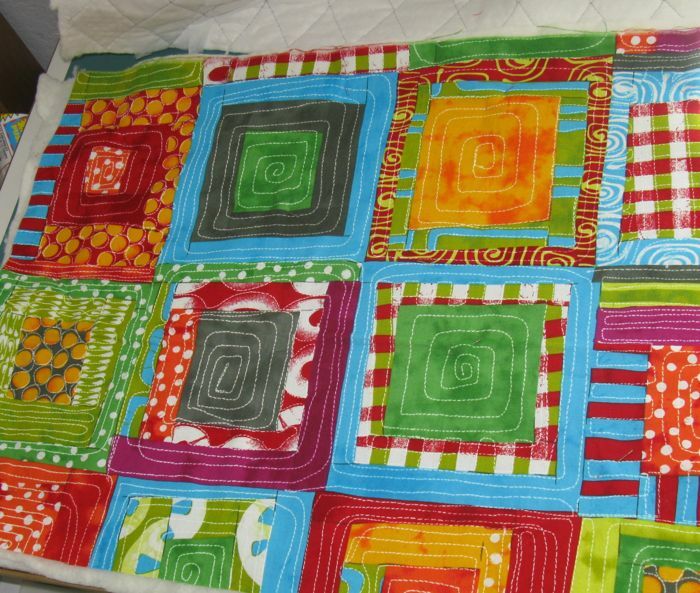 These kinds of quilts can stretch us as quilters, as well as teach us patience and confidence. But it’s good practice to make up one point of your star to see if you like it, knowing that with a few snips, you can change it out. I kept doing this until I was happy with my choices, and again, made one more star point to check. I liked it a lot better. Carry on! 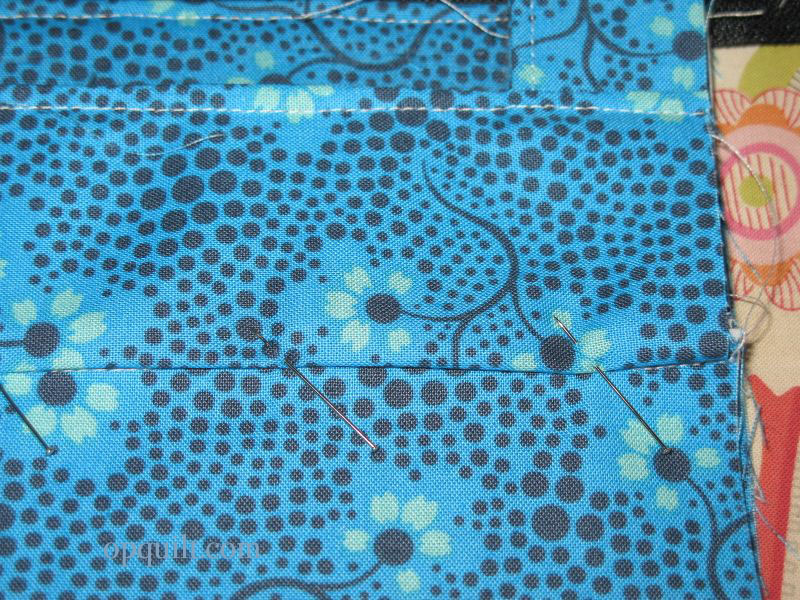 This is the photo I took this morning before I starched and ironed it, and you can see how it looks, all soft from the handwork. 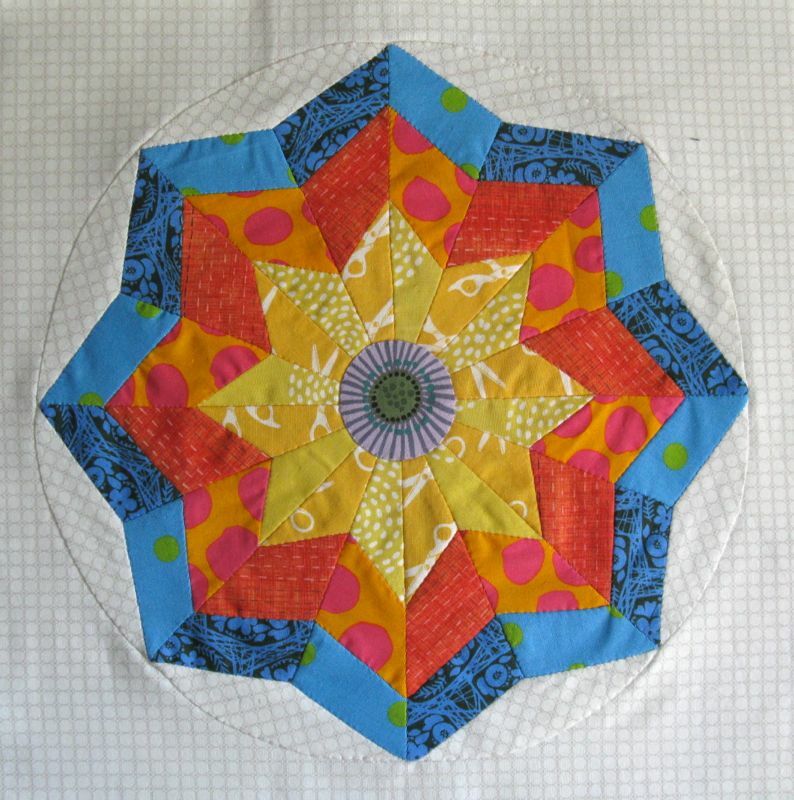 I used the same technique I used in Circles #3, of appliquéing the large pointed circle onto a 14.5″ square of background. 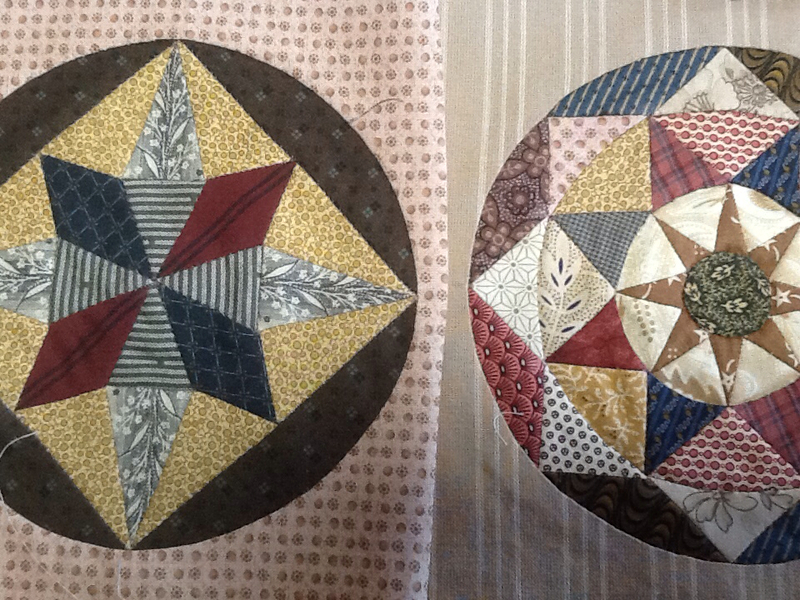 Then I appliqué that smaller center circle on, cut out the underneath, snipping away the yellow points. Before I’d done that, it was a bit lumpy there, but it all flattened out once I cut away the points. I love that color of blue against that tangeriney orange in the second division. And yes, it is the correct size. 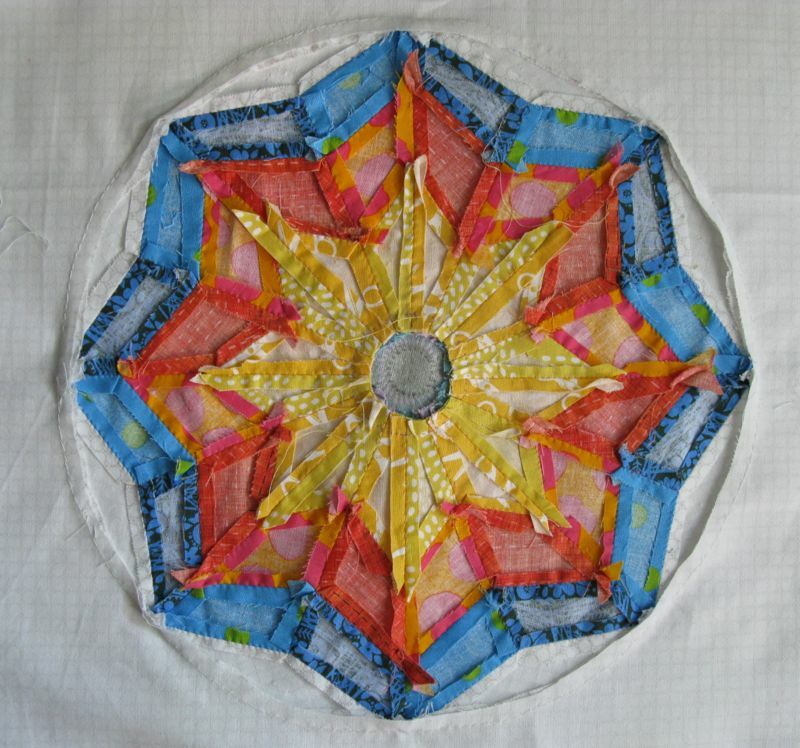 And I found this post from Quilt Inspiration about another quilter’s journey in circles. I’ll post the next circles block sometime around the first part of November. Have fun sewing! Posted on August 23, 2013 by Elizabeth E.
I’m sure you can think of others. Send me a note telling me what you used yours for! Finally, to thank you for your readership, I’m giving away the white flowered project folio to one of my followers or Bloglovin’/Feedly readers. In your comment (at the end of this post), tell me what you’d use your portfolio for, and tell me how you follow me. I’ll close this giveaway on early Monday morning (8/26), and send it off. They fit in my tote bag easily. Because one side is vinyl, you can see what’s in there quickly. Because the other side is fabric, they don’t stick together and slide out without difficulty. Reminder: All of these measure roughly 11 x 17. 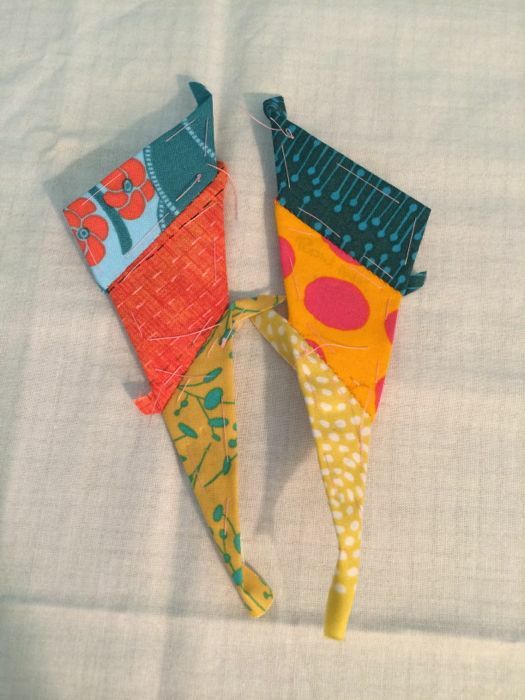 You are more than welcome to make these for your own use, or sell them in a craft faire, but please please, don’t take any of my tutorial and copy it onto your blog. Practice Friendly Attribution, if you please, by linking back here, if you would. And please please don’t steal borrow my content to make your own pattern, and call it your own. Okay, the folios are in the home stretch. Let’s bring ’em home! If you are coming into this tutorial mid-way, see previous posts Part I and Part II. A zipper is made of two narrow pieces of tape (think of it as stiff fabric ) joined by an interesting plastic coil. Usually these strips of fabric are hooked together at one end. Years of no Home Economic Education has scared most sewers when it comes to zippers, but when you think about it as two strips of fabric that have to be sewn into a seam, tempers and anxiety seem to lower. 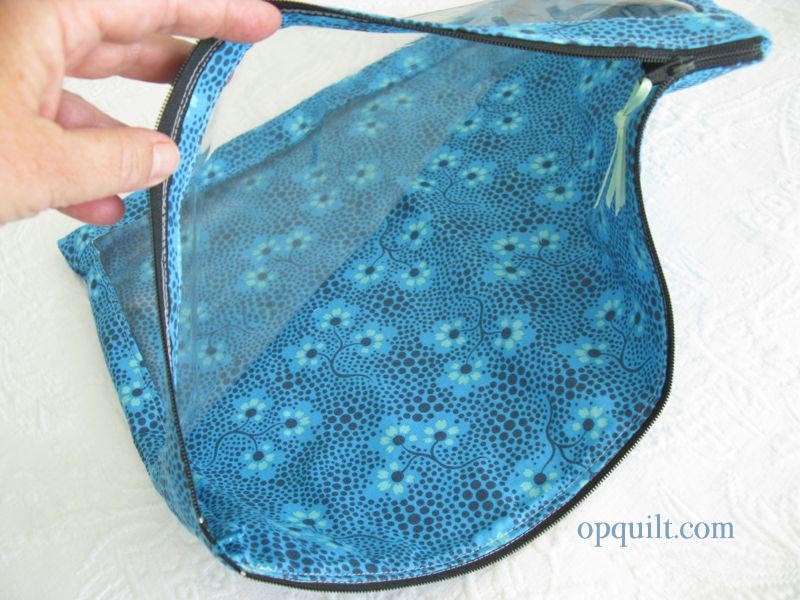 And when you get to sew the zipper in flat, like in this bag, things couldn’t be easier. 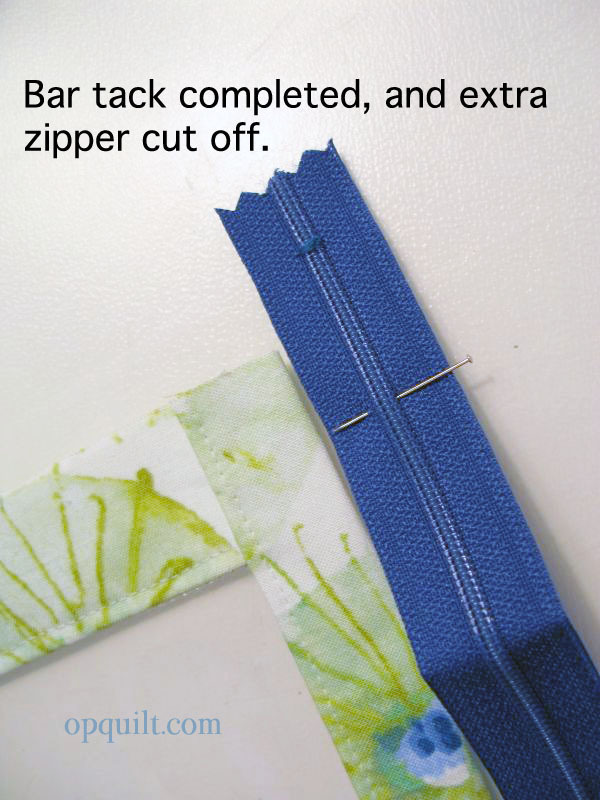 Note: Some of this tutorial is for beginners, so if you are experienced in zipper-putting-in, just scroll on down. You’ll be stitching this to the interfaced backing piece. 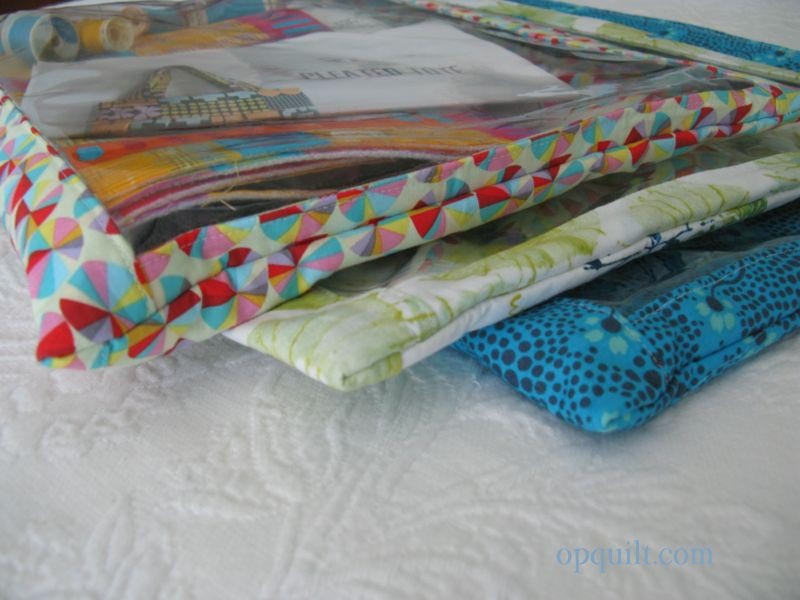 Set aside the fabric lining for a later step. 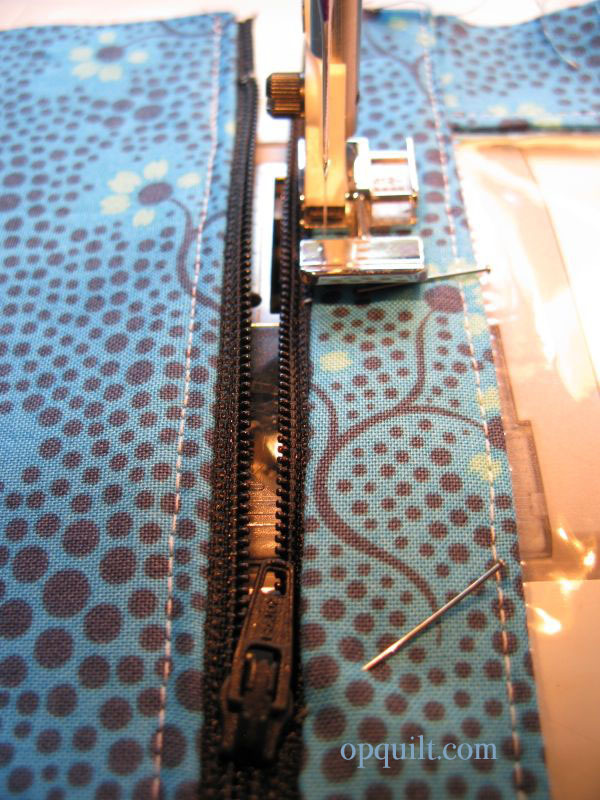 I usually buy zippers a little bigger than what I need, so if you have done the same, lay out your zipper along the 17″ longer edge of the project folio backing. Put one pin 1/2″ in from the raw edge, and one pin 1/2″ away from the raw edge, as shown up above on the left. 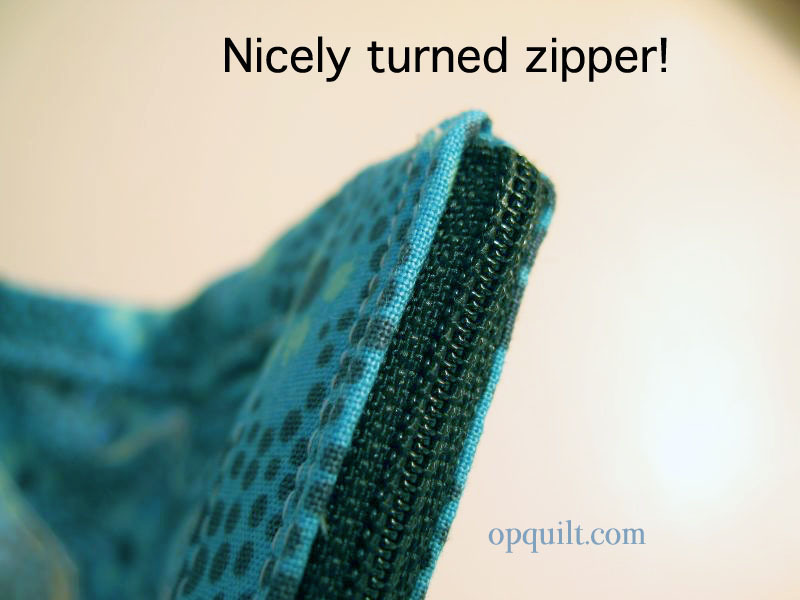 At the outer pin, you’ll be doing a bar tack, which is only a zig-zag stitch done in place. 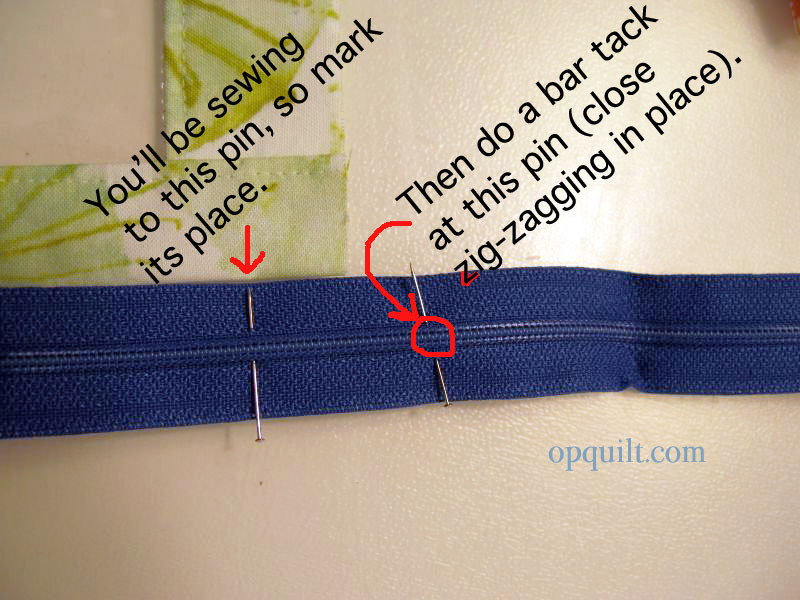 Set your sewing machine for a wide zig-zag (so it will clear the zipper teeth), your stitch length to zero, and sew the bar tack in place. 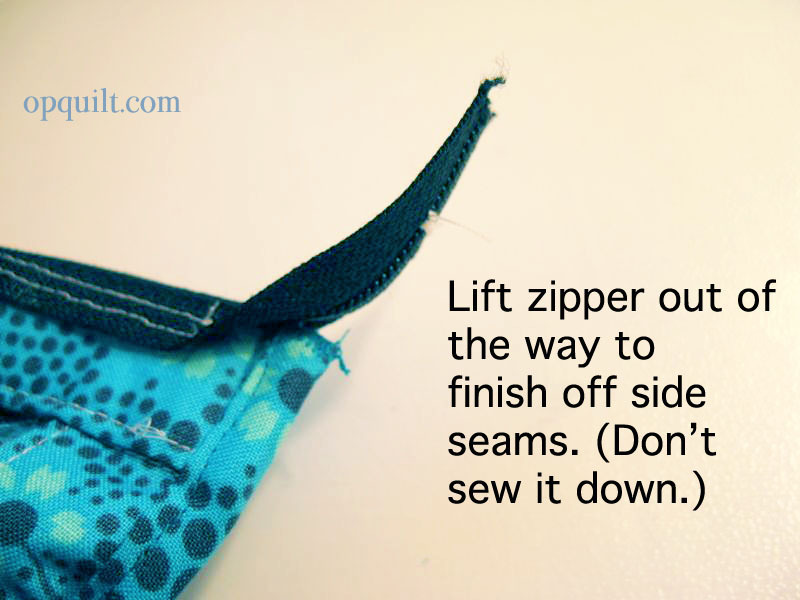 Then about 1/2″ away from that towards the zipper stop, trim off the zipper tape. If you are using a plastic zipper, you can cut right through it. 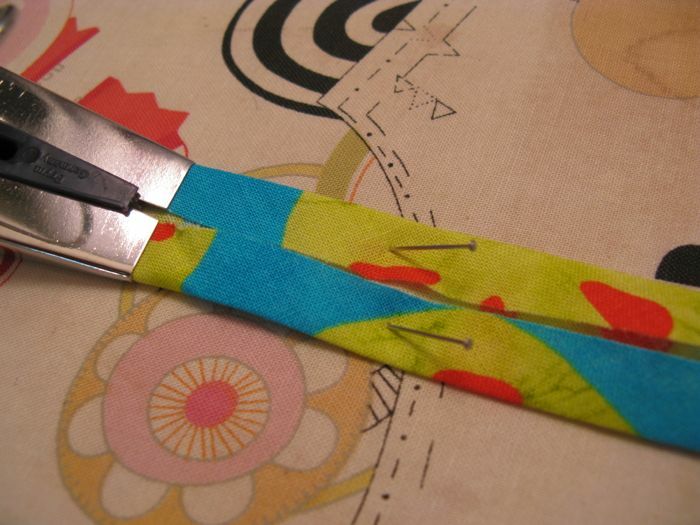 If you are using a metal zipper, snip the tape to the teeth, then kind of wiggle off the excess zipper tape. One of the challenges of zipper-sewing, is 1) sewing straight and 2) sewing close enough to the teeth, and 3) getting around that zipper pull. 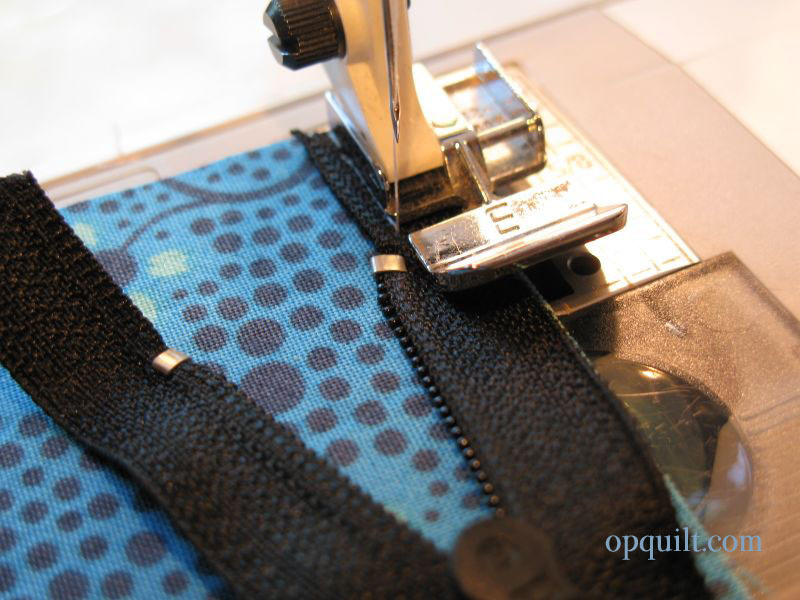 Use a zipper foot (shown above) for the second, and the first? Practice makes perfect, so don’t worry about it. I’ll walk you through the third, below. • along the 17″ side. 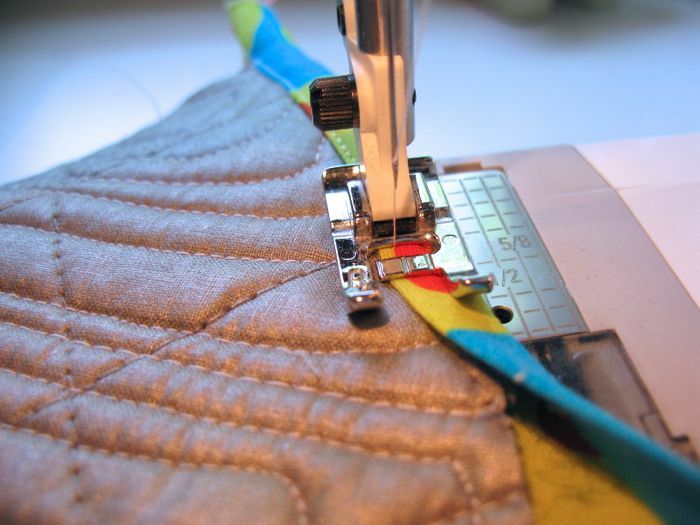 I align the outside long edge of the zipper with the raw edge in this application. Stitch to the top stop (the silver metal piece), re-align the long edge of the tape with the outside edge and stitch for another couple of inches. Stop, and put the needle down into the fabric. 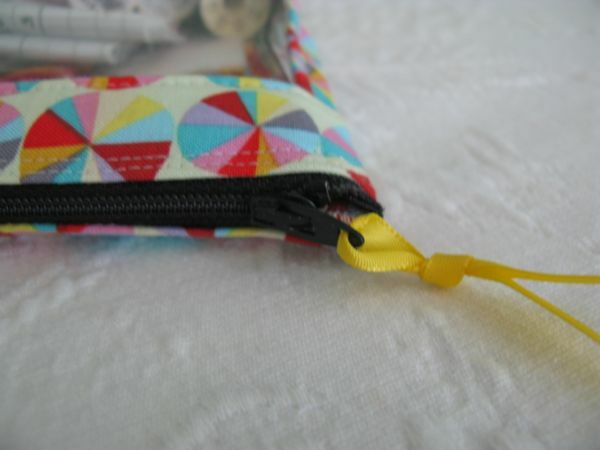 Then grab the zipper pull tab, and wiggle it past the needle and close the zipper. Now you have unlimited easy access to sewing it down. Remember that inner pin, set 1/2″ in from the raw edge? Sew to that spot. You want to leave the last 1/2″ unseen. 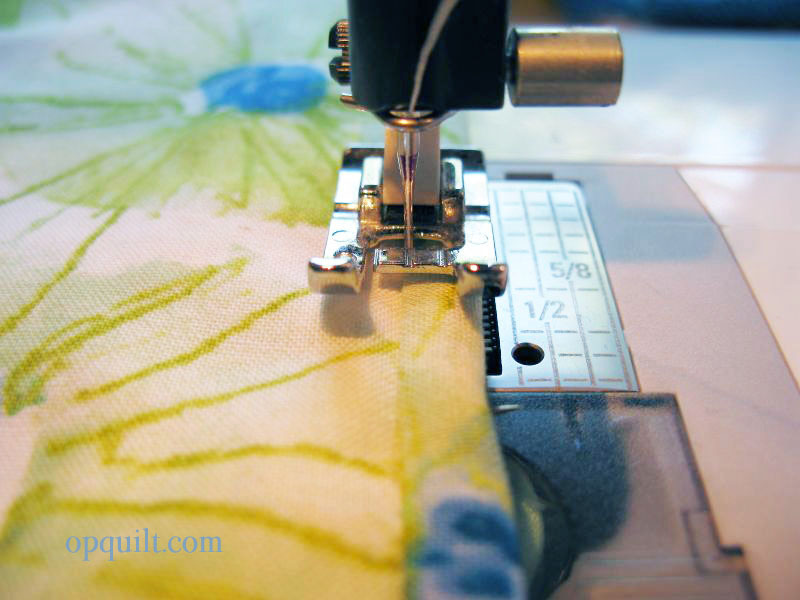 I usually hit the stitch-in-place button on my sewing machine, but you can also backstitch to secure it. 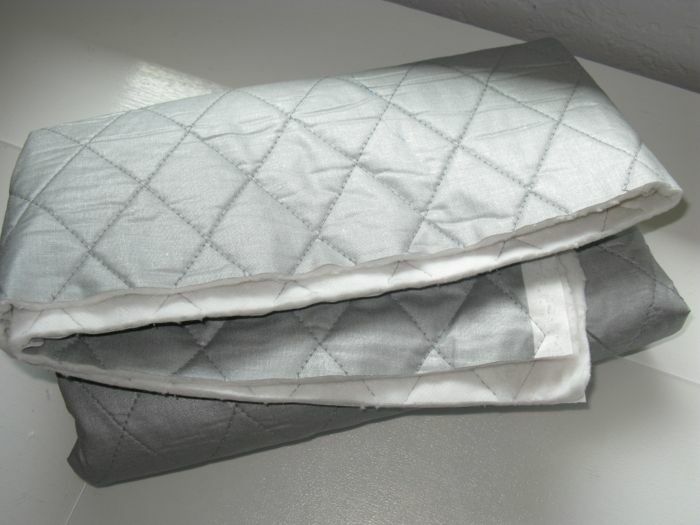 Now you’ll be attaching the lining to the back–that piece of fabric that is the same size as the back. Lay the lining for the back on the zipper. The zipper is face down so the RIGHT SIDE of the fabric will be facing the WRONG SIDE of the zipper. 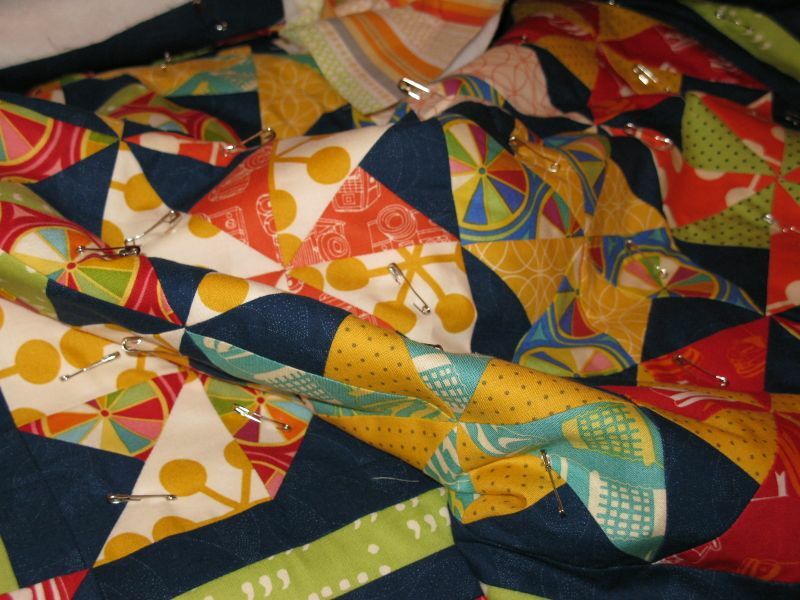 I pin the raw edges of the fabrics together in a few spots so I’m not scrambling as I sew. 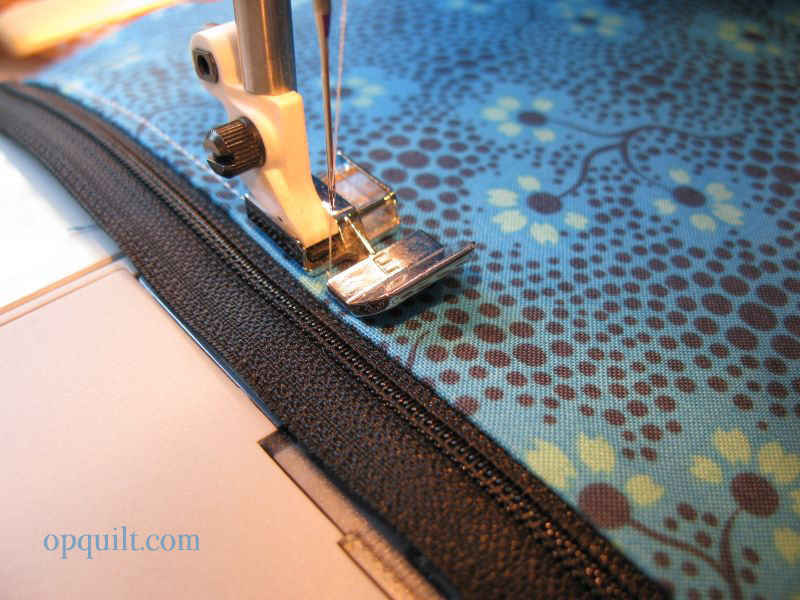 You’ll be sewing from the OTHER side of things, along the already-stitched line, so FLIP over the assembly, as shown below. 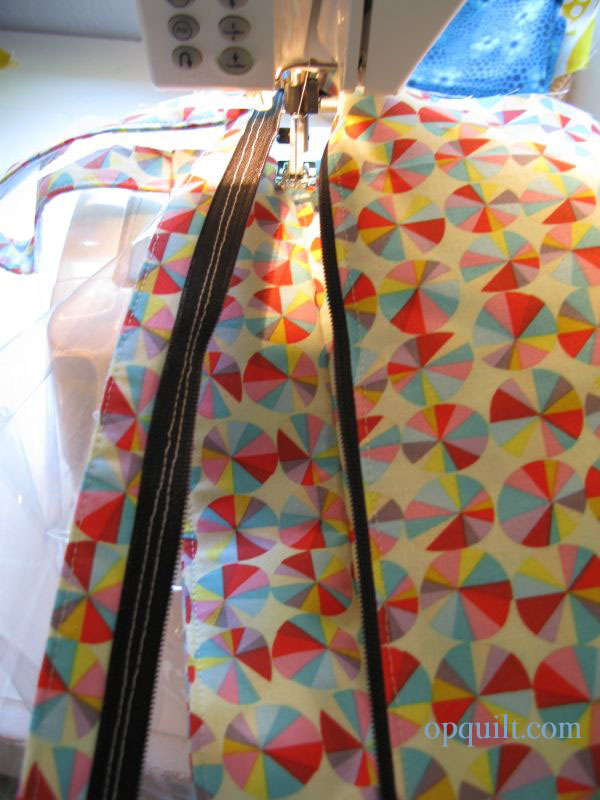 You’ll begin at the bottom edge of the sewn-in-zipper. 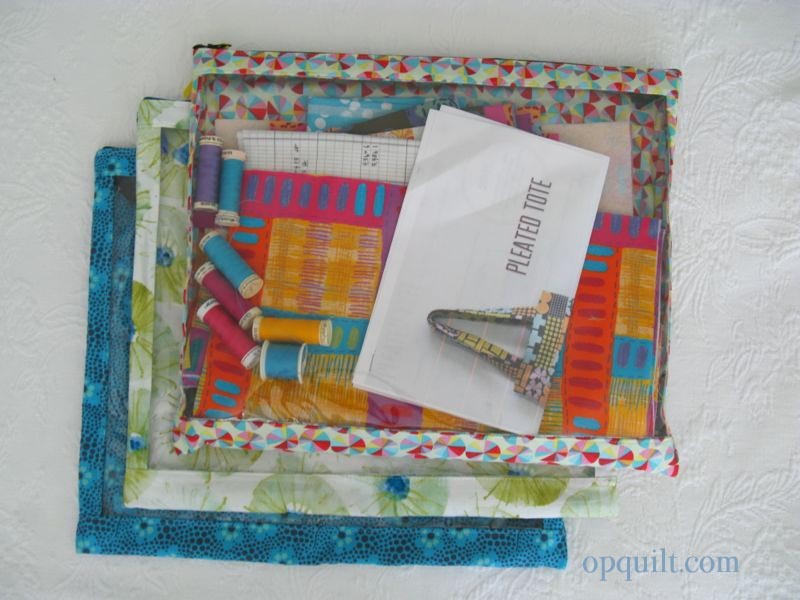 Remember to stay 1/2″ away from the raw edge as you begin. Stitch along the already-stitched line until you get about three inches from the end. Stop, and leave the needle in the fabric. 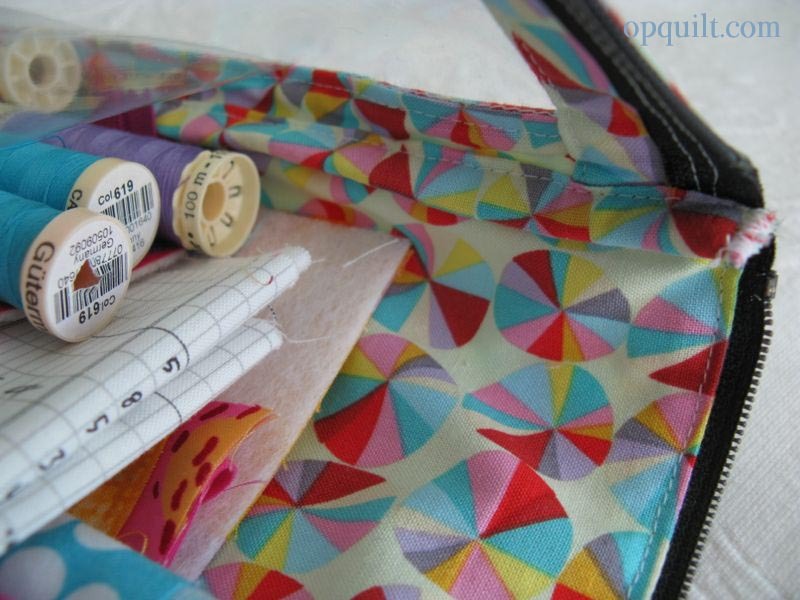 Reach inside and and slide the zipper pull tab down past your needle, wiggling it as you go by the needle, then continue stitching until the edge. 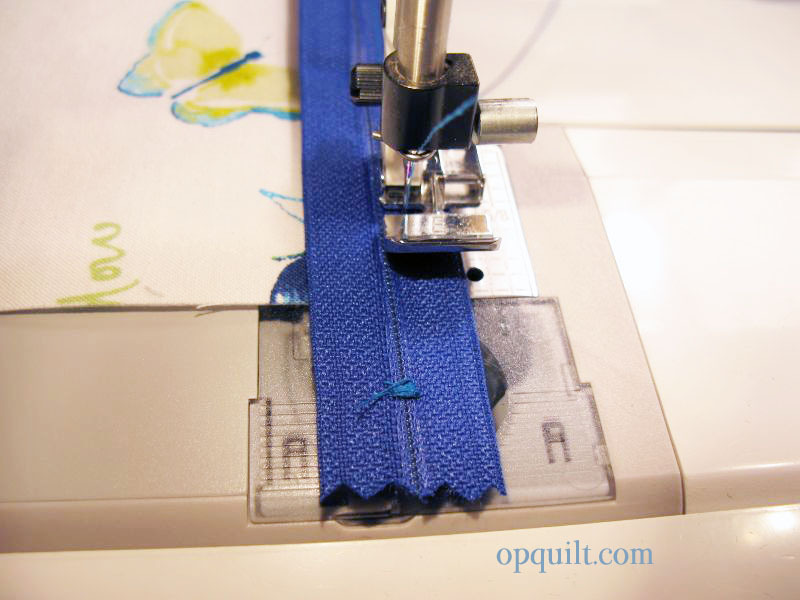 Press both sides away from the zipper, then topstitch close to the edge, about 1/8″ away. The other side is easier because you only have don’t have a lining to deal with. The zipper is now flat, intalled on the back. Working on a flat surface, line up the back with the front, aligning the side raw edges, as shown. 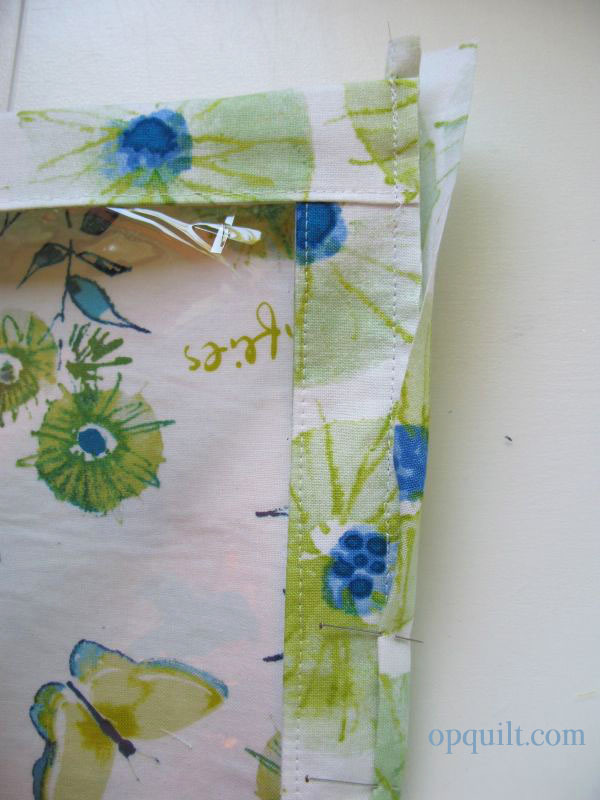 Place a few pins anchoring the zipper tape to the front upper edge of the front vinyl window. 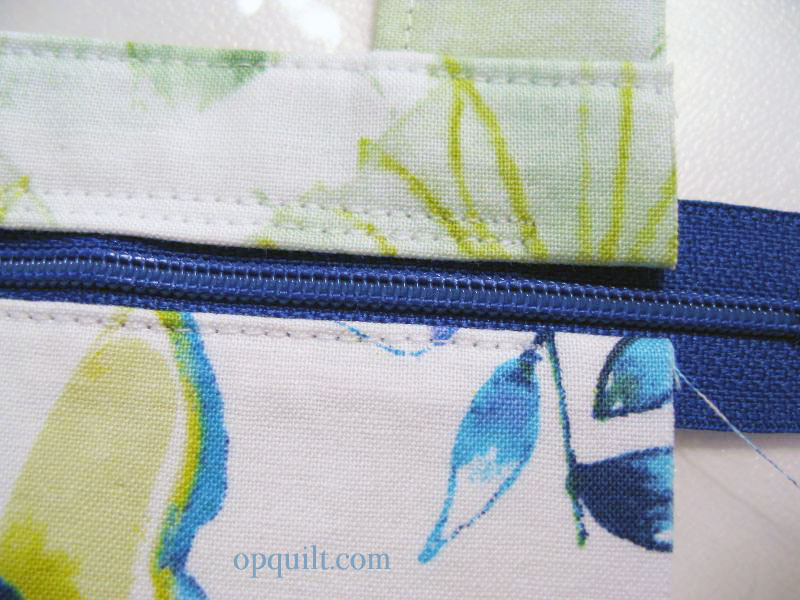 Slide the zipper pull tab down a couple of inches, and start stitching. 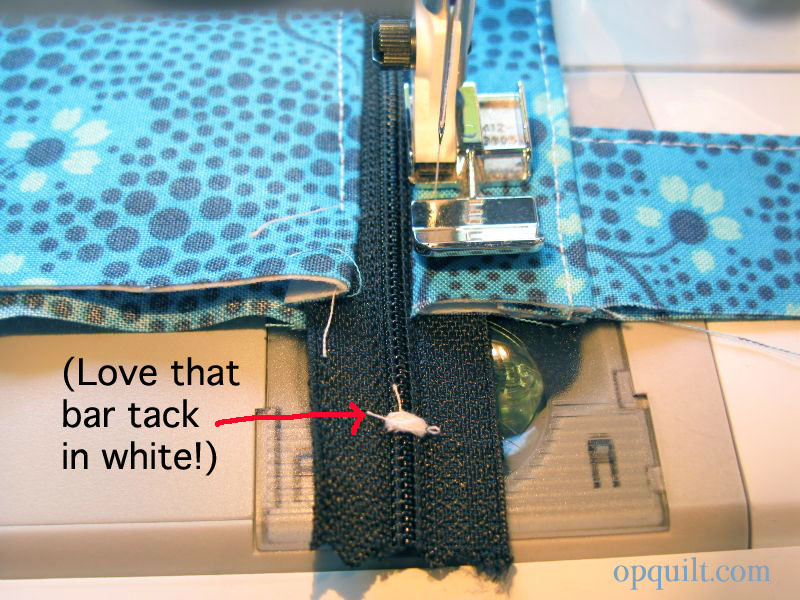 When you get close to the zipper pull tab, keep the needle in your fabric, and ease the pull tab past your needle, closing the zipper. Continue stitching. 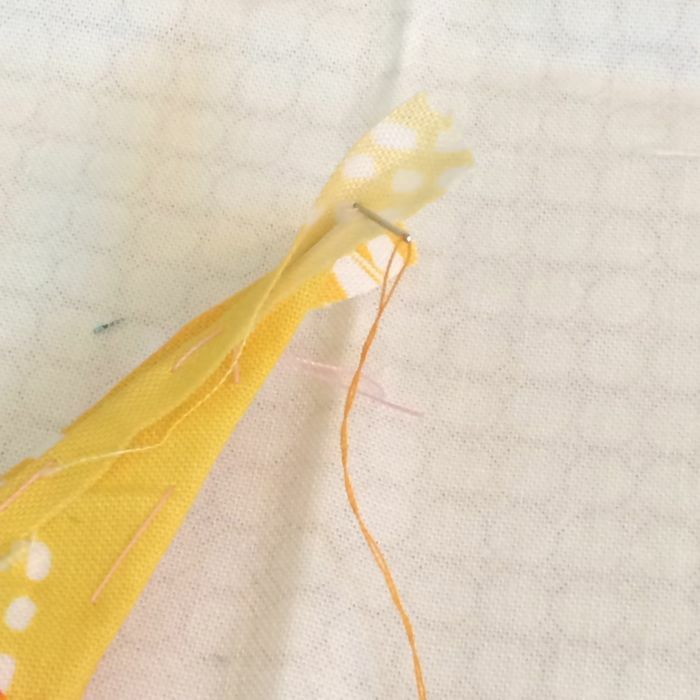 Remember to STOP stitching 1/2″ in from the other edge. I was racing through making these, so you get to see my hideous white bar tack on my zipper in white thread. No one is going to see this, so don’t worry. But do notice that I stopped 1/2″ away from the side raw edges. 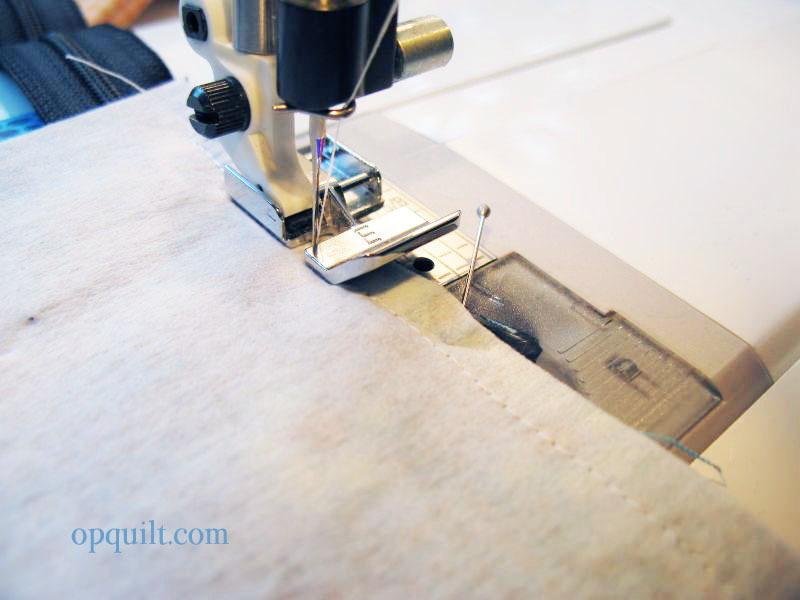 Stitch alongside your first stitching line, about 1/8″ away. Notice how both stop at the right place, above. This second stitching will help anchor the zipper tape. 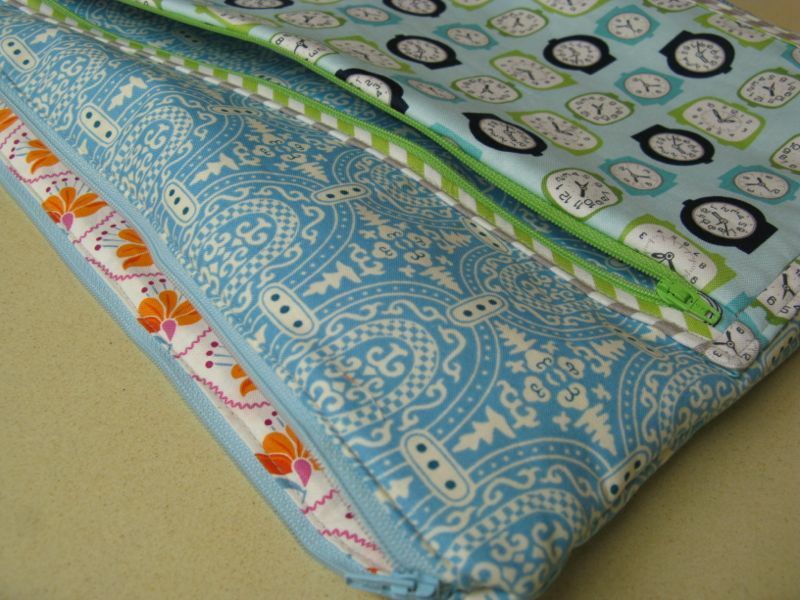 You can stitch 1/4″ away, if you like. Remember how the back of this thing is longer than the front vinyl window part? You’ll now stitch them together. 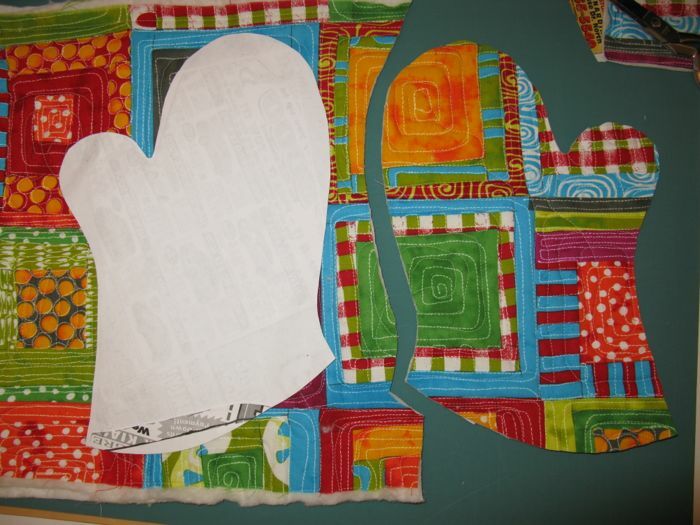 First, treat the back two pieces as one, pinning them together at the lower edge. 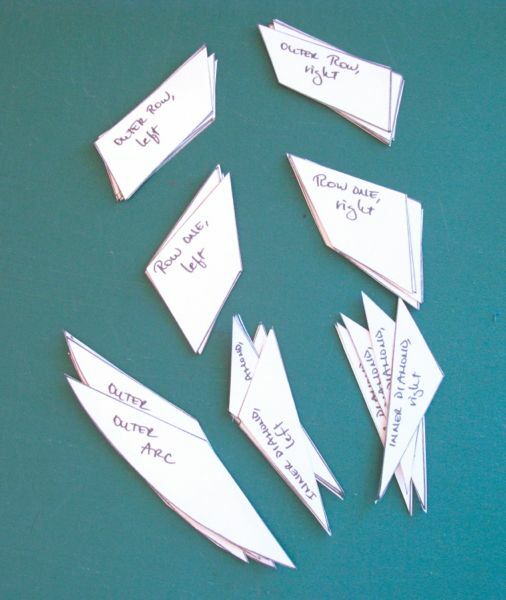 Now, lifting aside the lining on that 2 1/2″ piece on the bottom of the vinyl window, pin the interfaced strip to the back of the folio, matching raw edges, along the 17″ dimension. Another view is below. This is taken from the vinyl window side, and you can see it gleaming there in the photo. But again, you are sewing the interfaced strip along the lower vinyl window to the two pieces of the back, treating them as one piece. 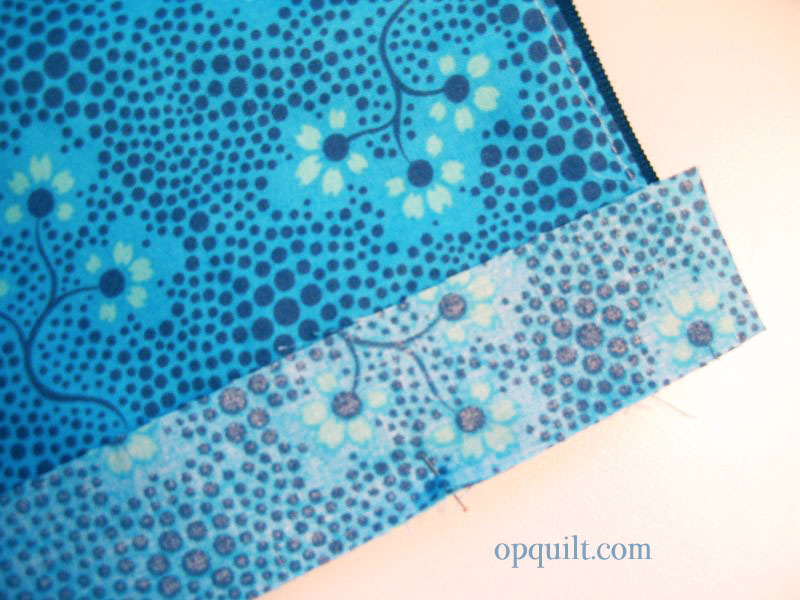 Stitch in a 1/4″ seam, then press to one side, towards the front. 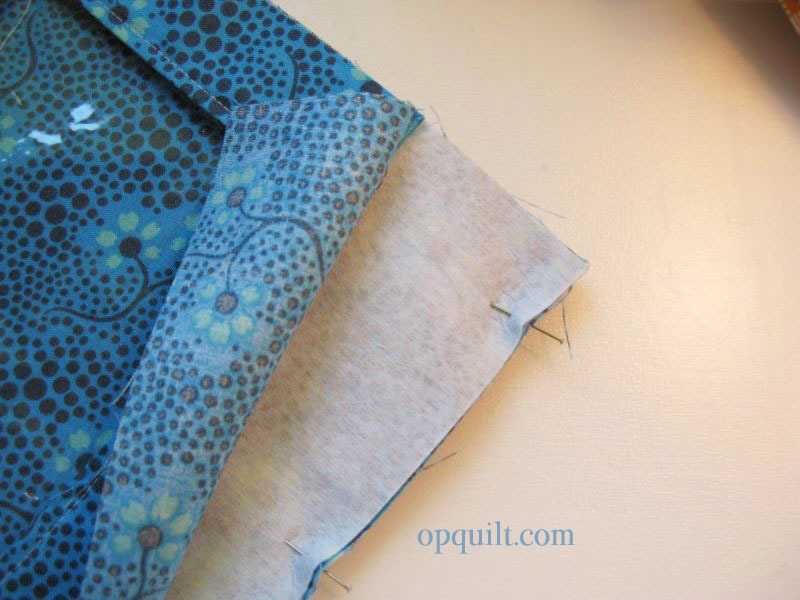 Fold down the loose piece, tucking the raw edge up to the inside, and pin in place, hiding that seam you just sewed. 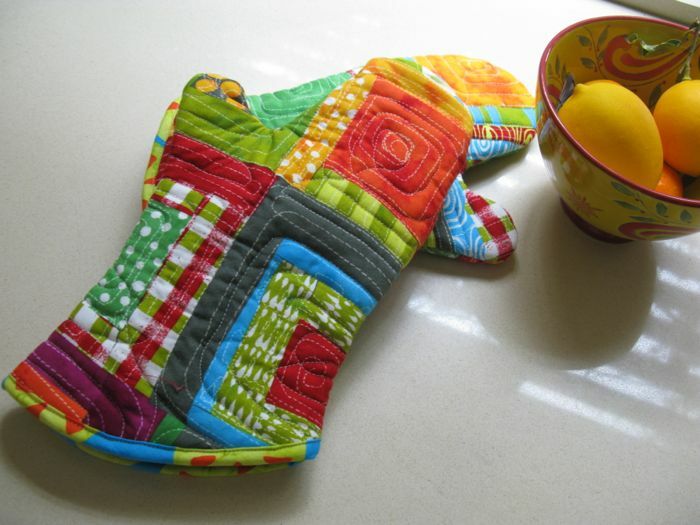 You can sew this by hand, taking small stitches, or you can machine stitch this closed. 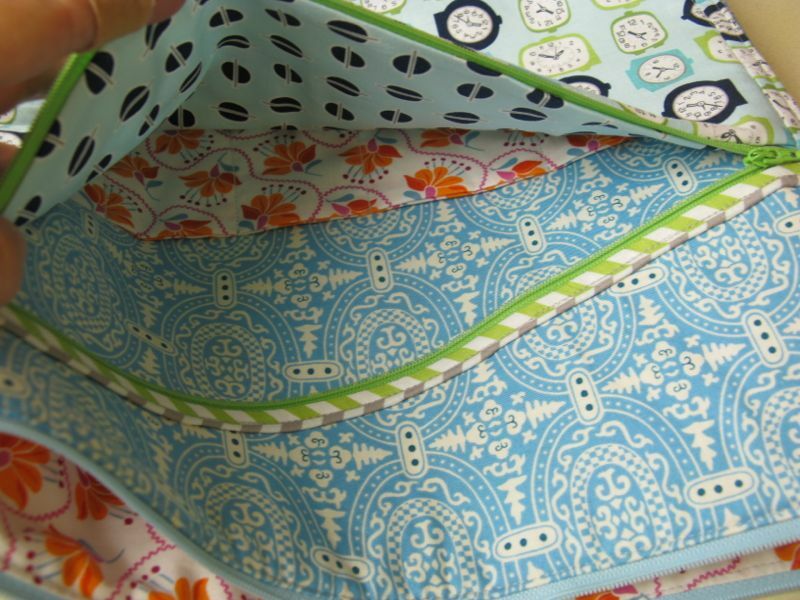 With both the bottom seam and the zipper seam completed, your portfolio is now a tube. Press that seam, keeping your iron away from the vinyl. 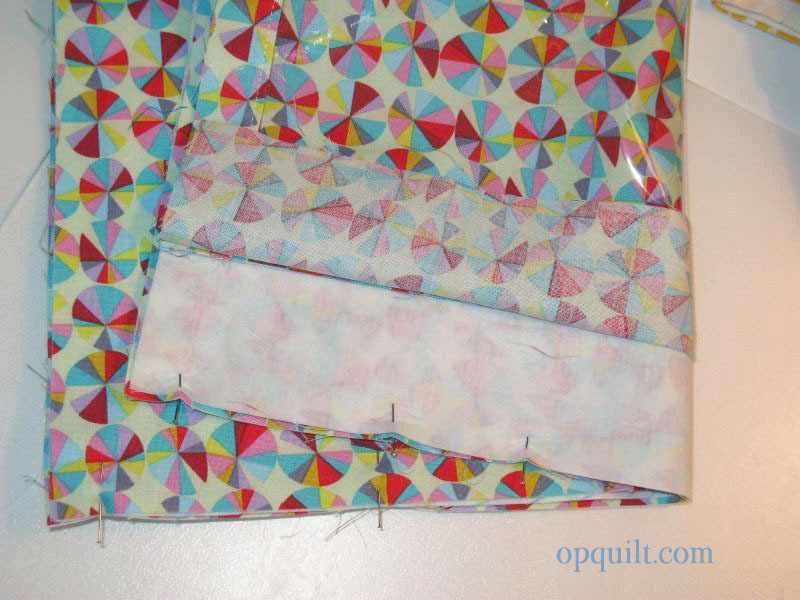 Starting at the zipper edge, line up the sides, pinning occasionally, raw edges even. 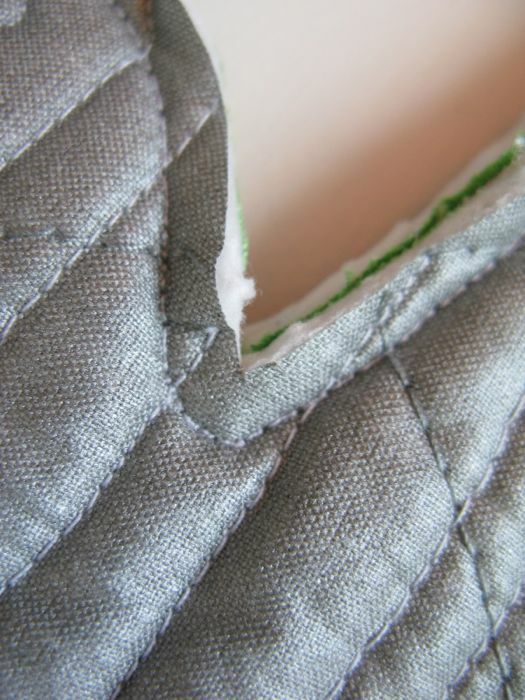 The bottom seam will loop around towards the front, so don’t try to force it. 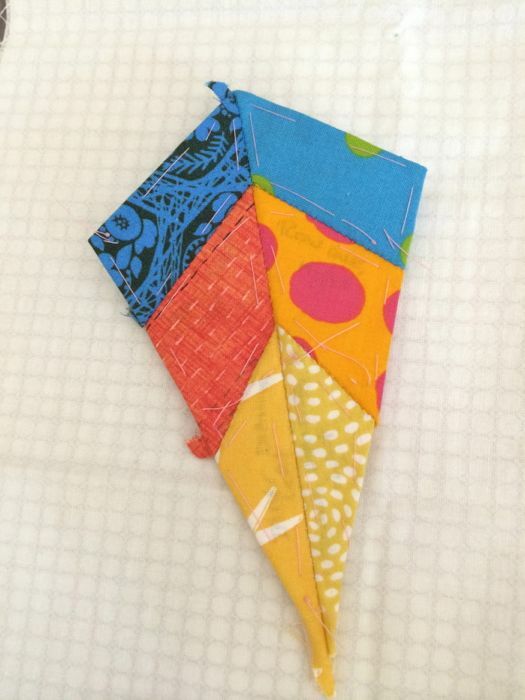 Stitch, then stitch again, 1/4″ inch away. Trim. This is a better photo, and you can see how the seams don’t match up to where you think they will at the bottom. Just let them go where they want to. 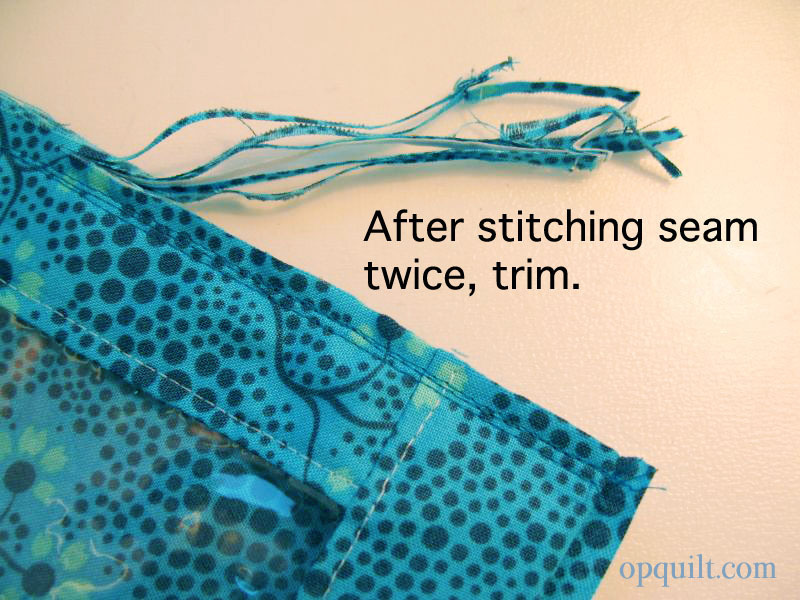 You can simply zig-zag those side seams to finish them, or make a simple binding. 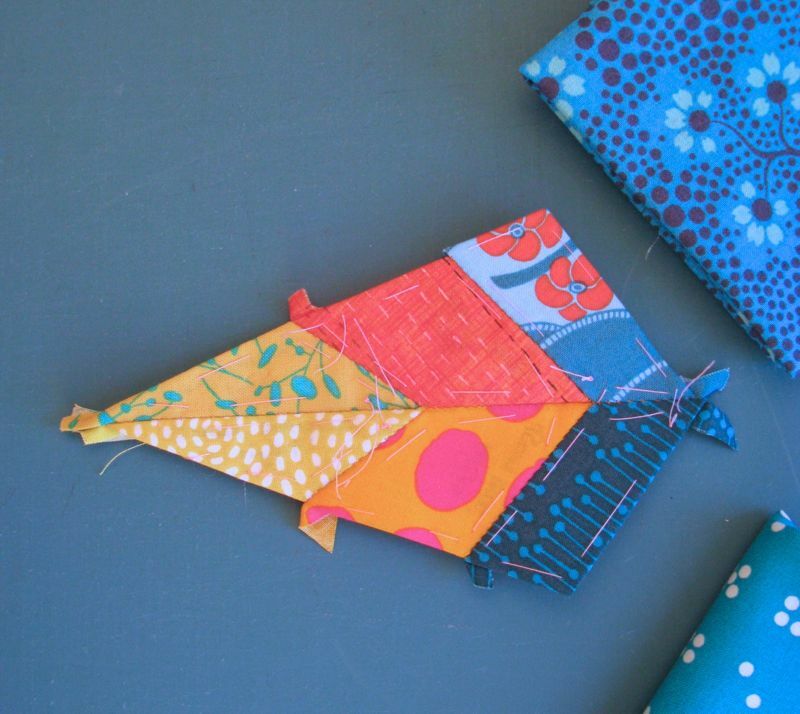 Cut a piece of fabric about an inch and 1/2″ wide and a bit longer than your sides (should be about 16 x 1.5″ in a perfect world). 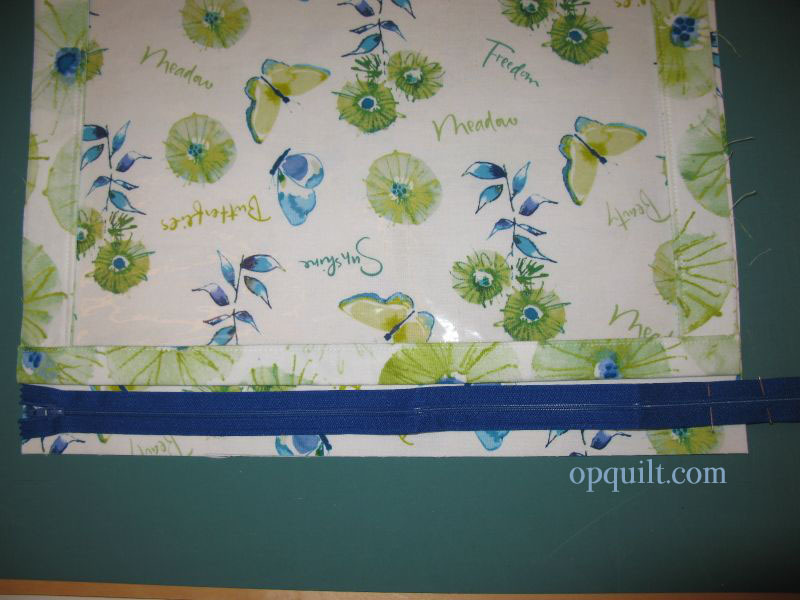 Matching raw edges, sew the long side of the binding strip to the portfolio side seam. 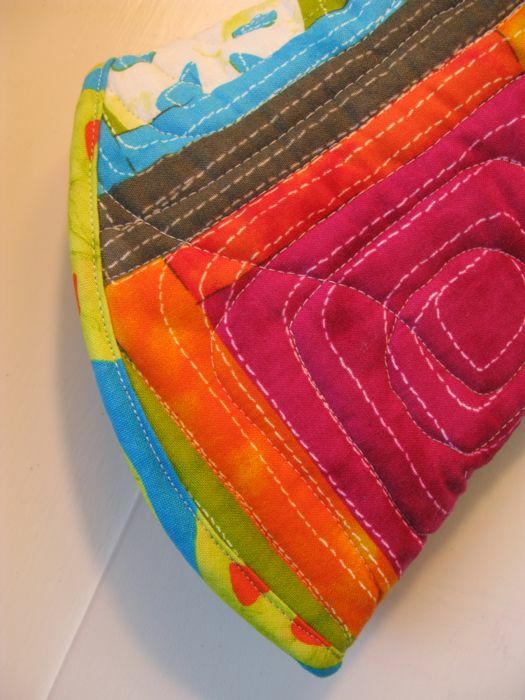 You can pin it, and then flip it over to stitch over the previous stitching, like you did with the zipper, if you want. 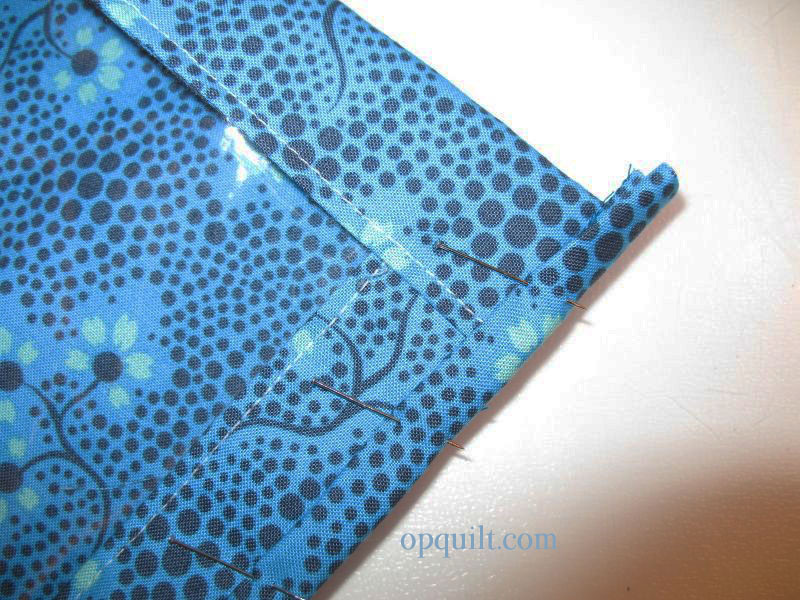 Then fold the long raw edge in and fold the binding over the raw seam allowances. Pin, as shown above, and below. Stitch close to the folded edge, securing the binding in place. Make sure you do not stitch the zipper into your seam. Lift it up and out of the way. 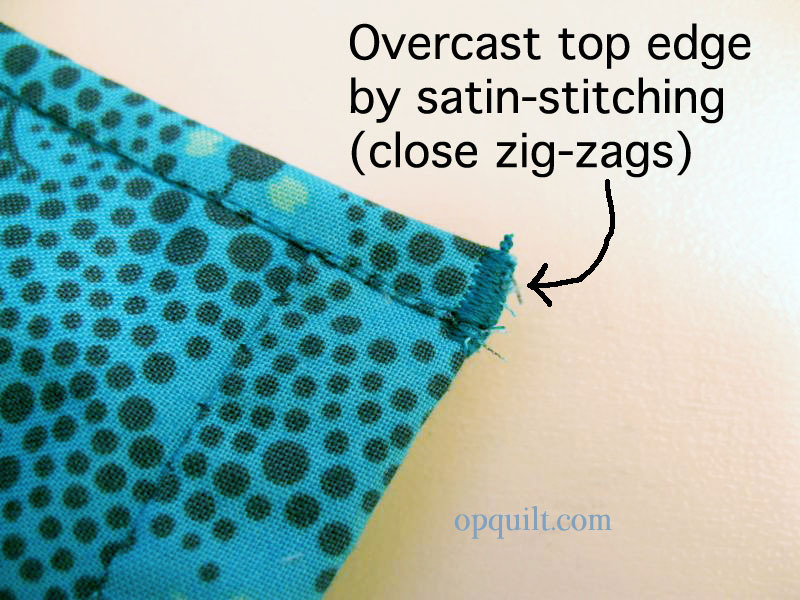 Trim the binding even with the side seams, then zig-zag (overcast it) to keep the ends from fraying. Again, lift the zipper up and out of the way. 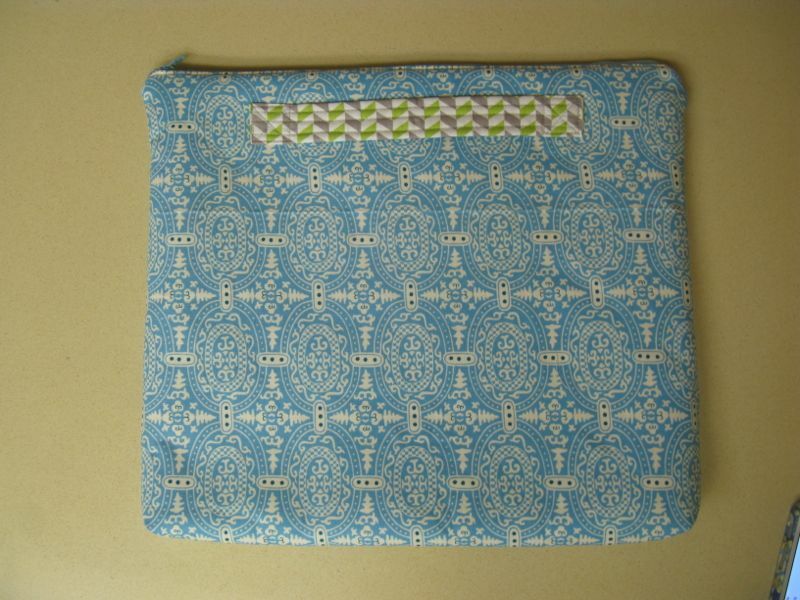 Flip the folio inside out and wiggle that end of the zipper to a nice squared-off edge. Congratulate yourself! You are done! Here’s what the other side looks like, interior view. I thread a bit of ribbon through my zipper pulls to make them easier to grab. 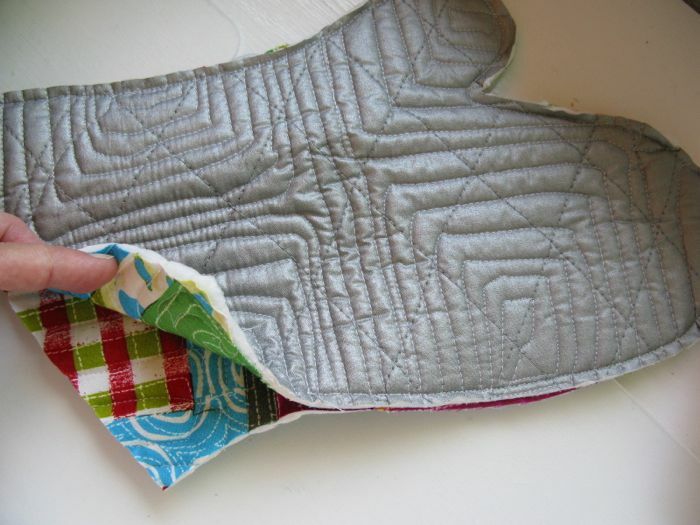 Trim the edges at an angle, and apply a little bit of Fray Chek to them, if you are worried about fraying. Okay, now tell me how you’ll use your flowered Elizabeth’s Project Folio in your comment below, and how you follow me (email, Feedly, Bloglovin’). Note: the Giveaway is closed now, but thanks for stopping by! Posted on June 26, 2013 by Elizabeth E.
UPDATE: I’ve revised this post, because this morning I realized that TODAY is Wednesday, not yesterday (when I’d originally written it: we’re a little foggy on life over here), so today I am linking up with Lee at Freshly Pieced for WIP Wednesday. I joined a new bee (newby! newby!). 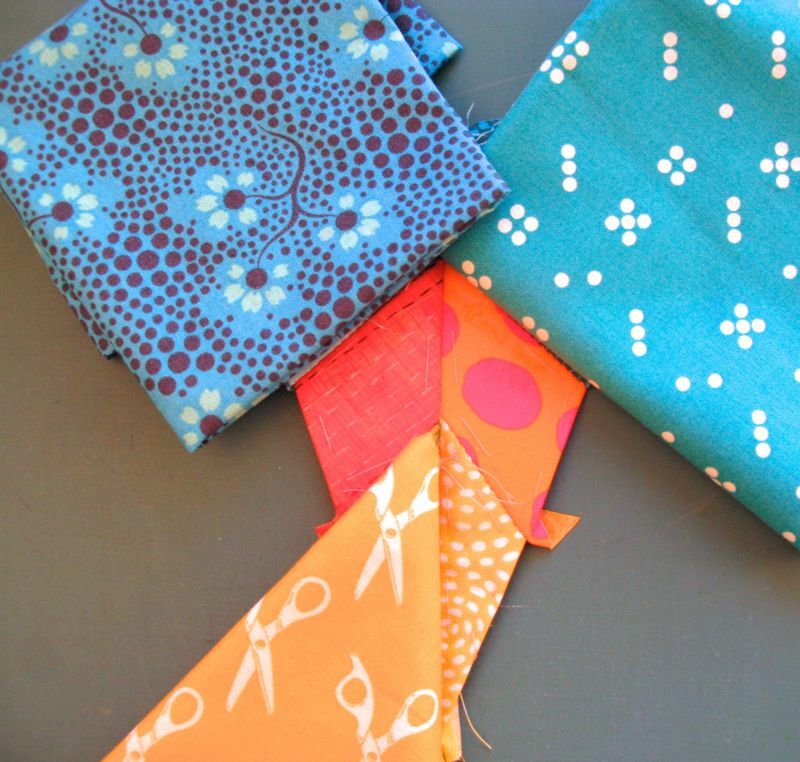 I am honored to be included in the Always Bee Learning bee, and the first block’s fabrics have arrived to be sewn (they have different rules than the Mid-Century Modern bee). But Linda’s blocks for the MCM bee still hadn’t been made, and I like to honor my deadlines. 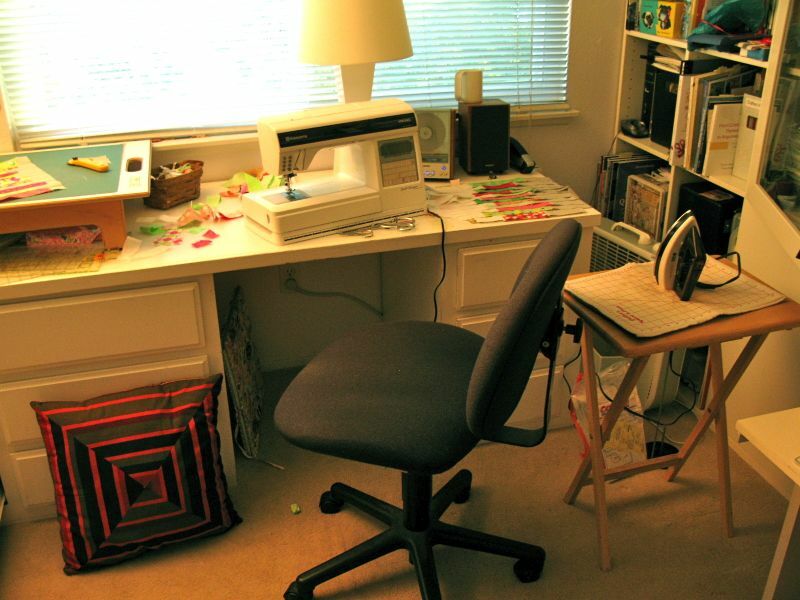 So I gimped down to the sewing room, pulled out a drawer and put a pillow on it for the left foot, got out my portable iron and pad and put it on the table on the right. I figured it was good to be sewing as long as I wasn’t putting any weight on the foot, right? (I’m really hoping that MY idea of “partial weight-bearing” agrees with the doctor’s). But had to stand for a few minutes on my right leg while I cut the strips, then I sat and sewed. And twisted to iron, but finished up one block before dinner. After dinner I finished the other one (normally we only do one, but everyone else was doing two and I didn’t want to be a slacker); I packaged it to mail tomorrow, hopefully making it to Florida by July 1st. That small block in the front? We do signature blocks with our Mid-Century Modern (MCM) bee. This is what Linda is doing with them: using them to border another set of blocks from another bee. 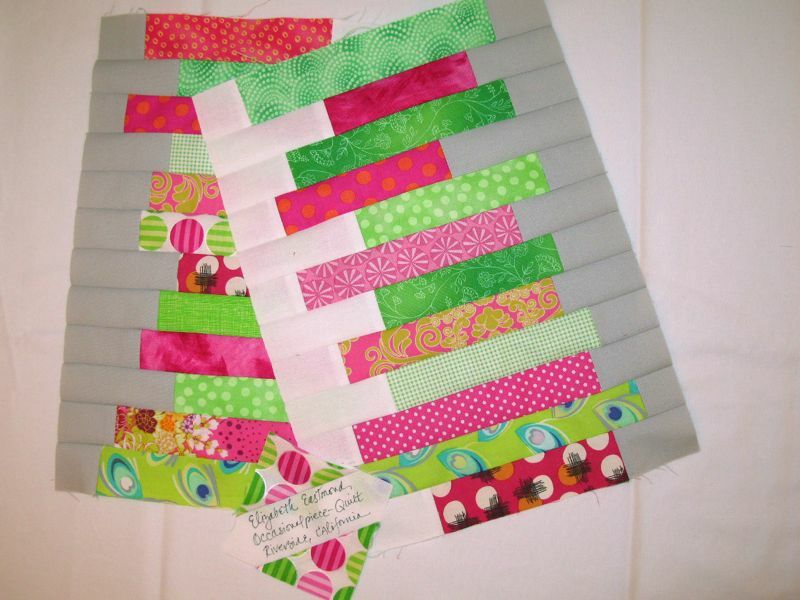 She says she’s stuck about what to do in the corner–maybe a rounded version of the stack?–so if you have any ideas, head over to her blog and leave her a comment. It’s always interesting to see our bee blocks being used. Another quilter in this bee finished up her quilt (scroll down to the Mid-Century Modern quilt in neutral fabrics); I hope when it’s my turn I can be as successful. At least I can be somewhat productive when I lay around here. What else am I working on? 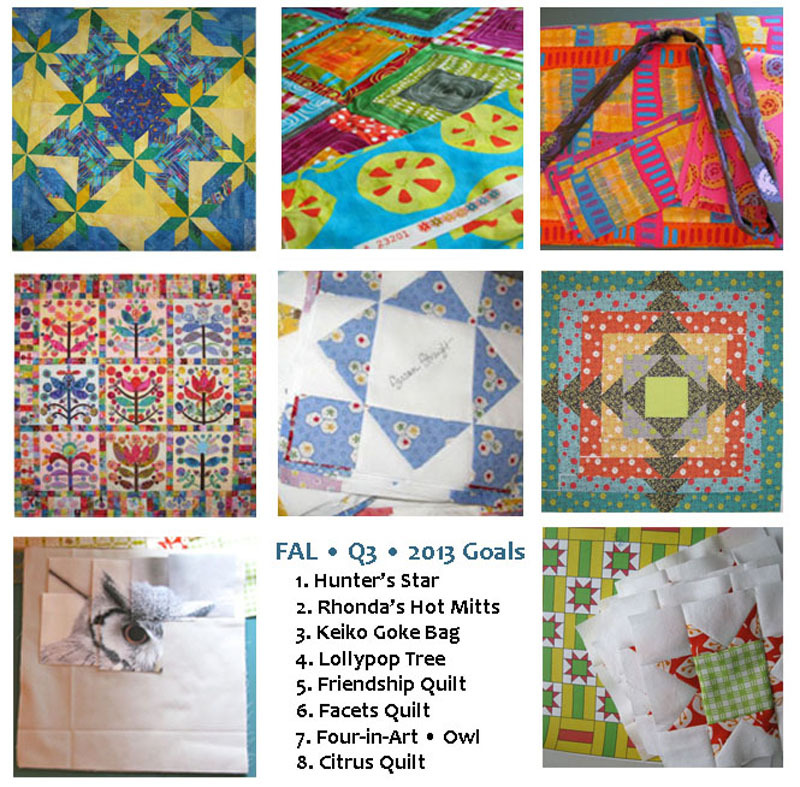 Well, another July 1st deadline is for this month’s Schnibbles quilt. My husband brought up a camp chair (small chair we use when we go camping) and I could slide it in the cubby hole of my sewing desk, and yes, I did get some of that top quilted last night. 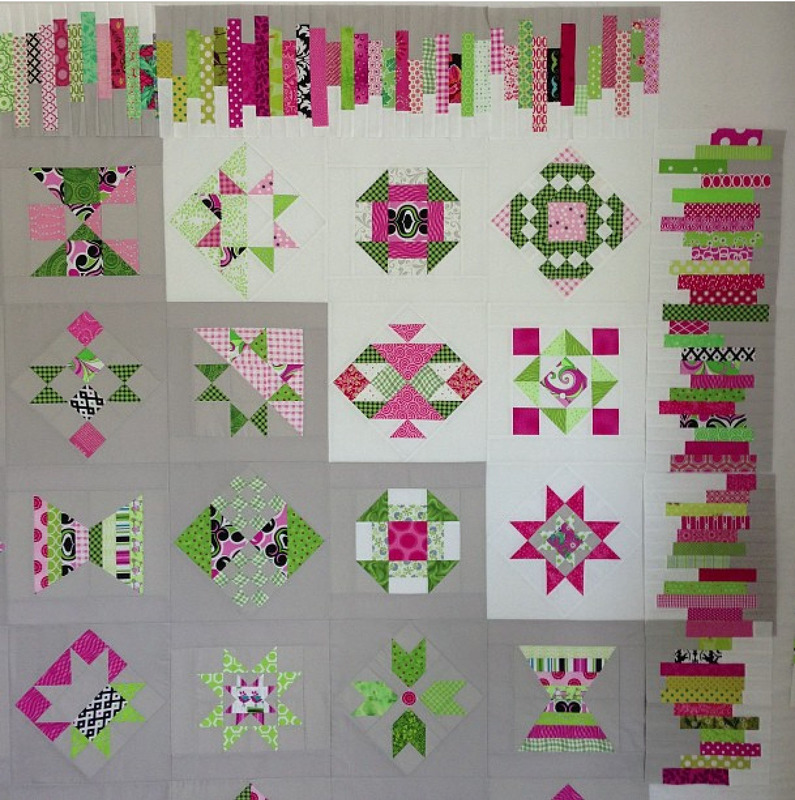 While I can only quilt for a short while, it feels good to be productive and to see a quilt take shape. Final thought: Happy Birthday, Rhonda! You are an inspiration, always. Posted on March 18, 2013 by Elizabeth E.
No, this isn’t a reference to our past election and Governor Romney. So one day, I turned the ones I liked inside-out to see how they were made. 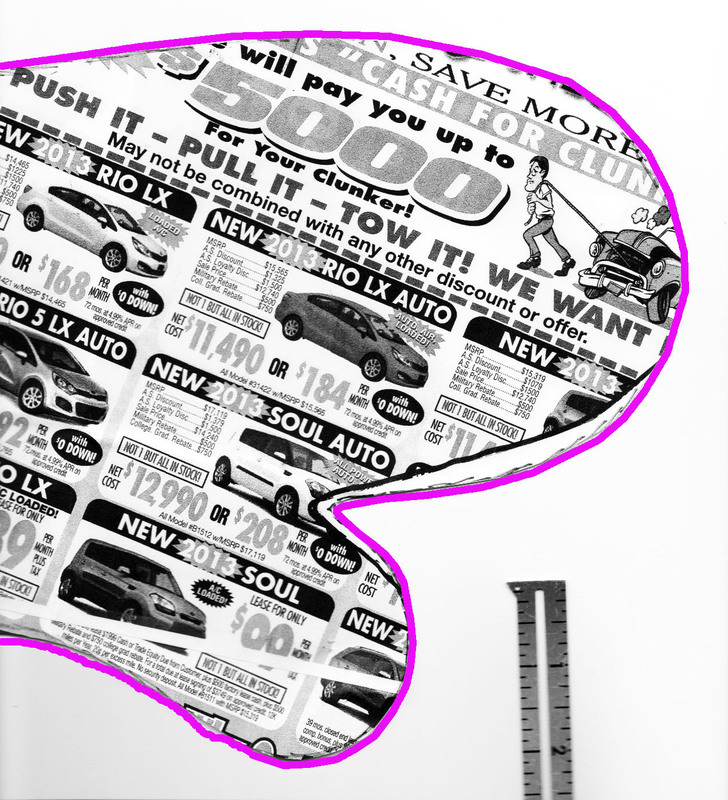 Then I traced it with a sharpie onto what was laying around on the counter–an ad from the car dealer. Actually this ended up being a good idea because it was thicker than regular paper and pretty sturdy. And after I cut it out, I had a pattern. But I decided I should allow for shrinkage, because I wash and dry these over and over, so I enlarged it by 10% which yielded the pattern at the end of this post. 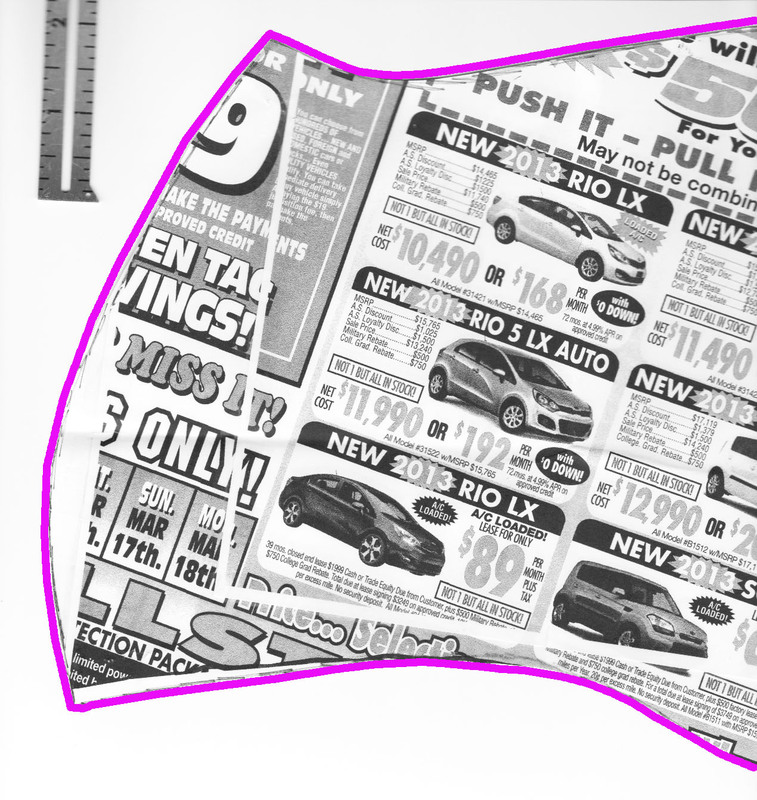 Print it out, match up the car writing and making sure your 1-inch guide on the side is really one-inch (every printer is a little bit different), tape it together and you’ve got a good pattern. I’d actually purchased a pattern but took it back when I realized how easy this was going to be. Go the Big Box fabric store and buy some utility fabric that looks like this: a metallic cotton on the outside, cotton batting on the inside, already quilted together. Use your coupon. I bought one yard and I’ll get four mitts out of it. Get yourself some 80% cotton/20% wool batting or some 100% cotton batting, if you don’t have scraps laying around. And throw a bias tape maker into your cart, too. I chose the 1″ version and it worked great. I picked up the Dritz (on the left) and on the right, I show the full complement of Clover Bias Tape Makers. Either work fine. They have decent directions on the back of the Dritz. Layer in the following order: (1) Utility fabric, metallic side down – then – (2) your cotton batting – then – (3) your chosen fabric. I’m using some of Malka Dubrawsky’s first line. I love it, but I have never figured out how to use it. This will be perfect as it will brighten up my kitchen every day. Using pins, secure it in a few places. Cut out what you need by placing your hot mitt pattern down and guesttimating: I think mine ended up about 14″ by 18.” Roughly. Quilt all layers together. Don’t get too precious about it! 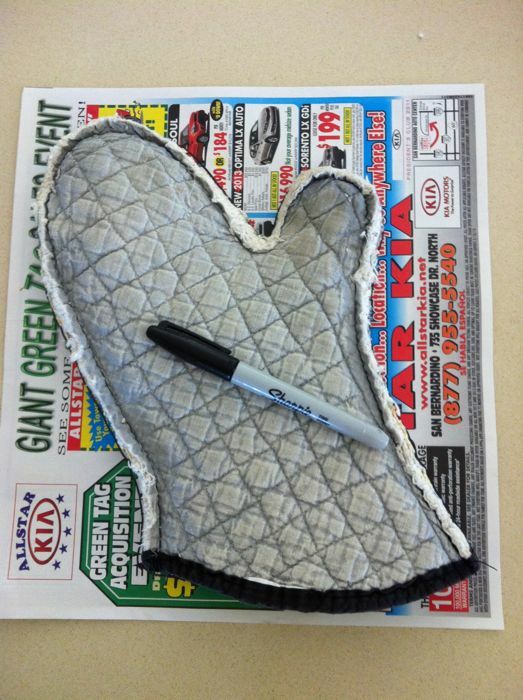 Now lay out your pattern and cut out one mitt. Reverse the pattern by flipping it over, and cut your second mitt. Match them up, metallic sides out, then pin in a few places so it doesn’t shift. 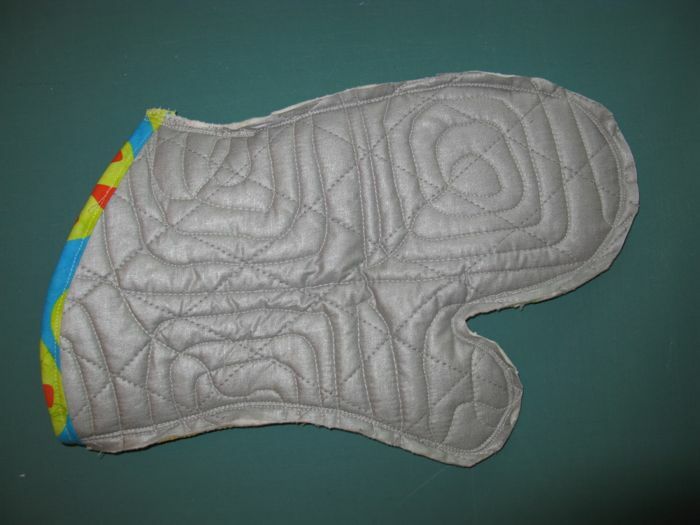 Sew from under the thumb all the way around the mitt STOPPING 2″ FROM EDGE. 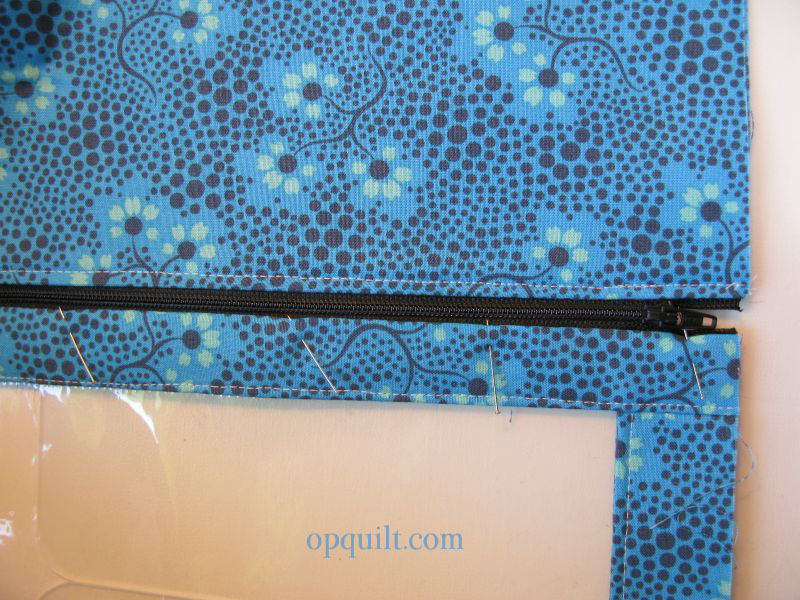 Leave that edge flapping, as it will be easier to attach the bias tape. Close-up of the curve of the thumb. 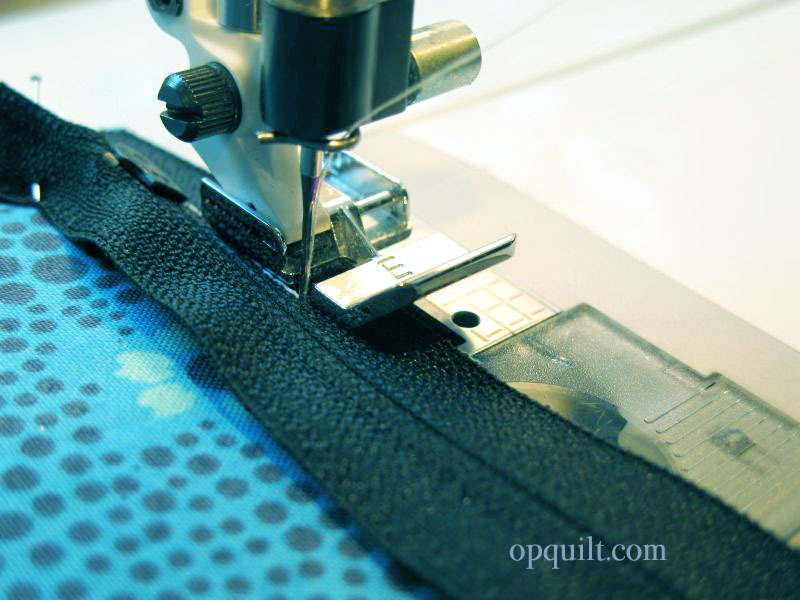 Carefully clip down to the curve, stopping short of the stitching line. This will make it lay better when you turn it inside out. Follow the directions on the back of the tape maker package for cuting a bias strip. Basically you fold the corner down into the fabric, creating a bias edge. 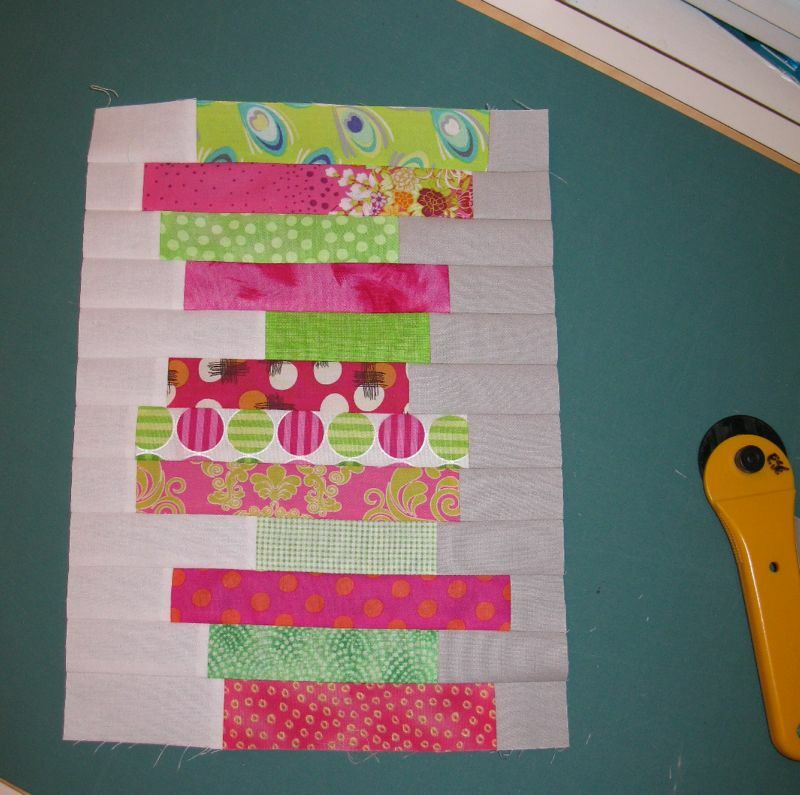 Cut the strips 1 3/4″ wide for a one-inch bias strip. Feed it through the bias tape maker tool, using a pin to help out the leading edge if you need to. 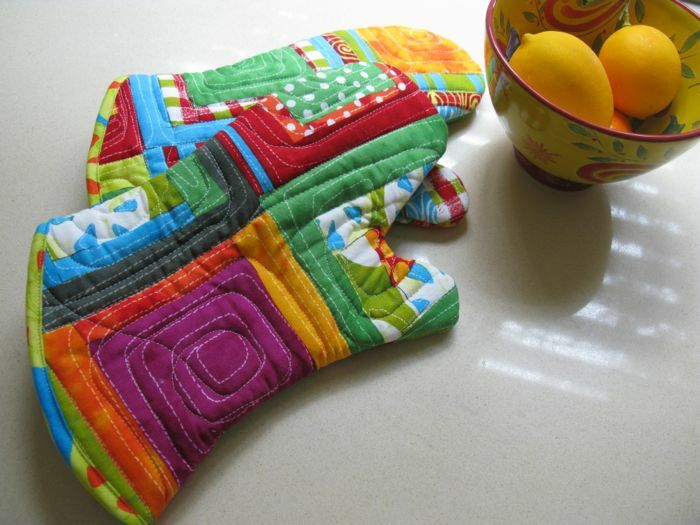 Then use your iron to set the folds. I put two pins on the tape, as I drew it out, and then pressed it. It sounds WAY more complicated than it is. 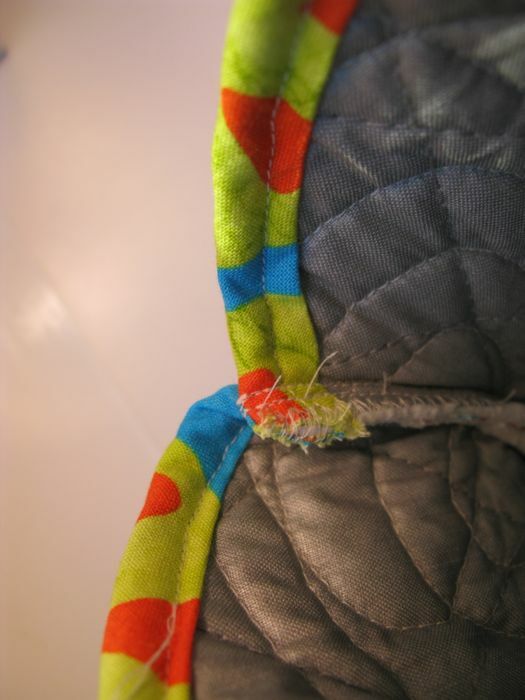 Beginning with one of the loose edges, fold the tape over the lower raw edge, and stitch the tape onto the mitt. I found it easiest to stitch from the “inside” for some odd reason. 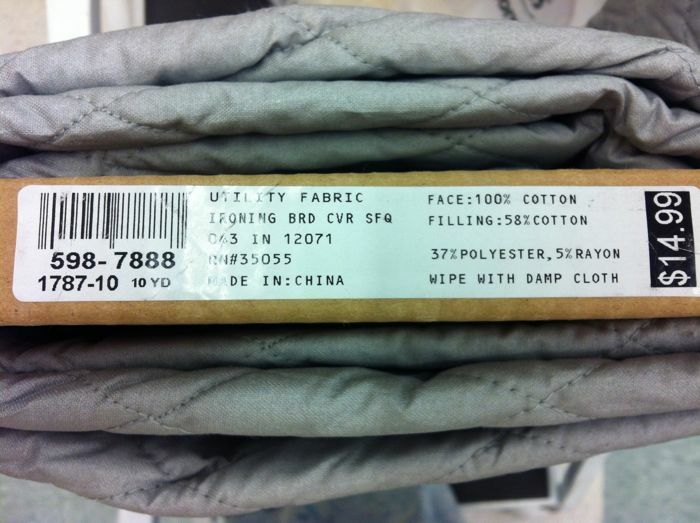 Again, don’t get too fanatical about this–just make sure that both folds of the tape are caught in the stitching. I did one, and then decided I wanted to trim out that seam allowance under the thumb edge for about one-quarter inch up from the lower edge, just to get rid of some bulk. The world won’t end if you don’t. Finish stitching that last two inches, and backstitch to secure. I also zig-zagged that last two inches to finish it off. 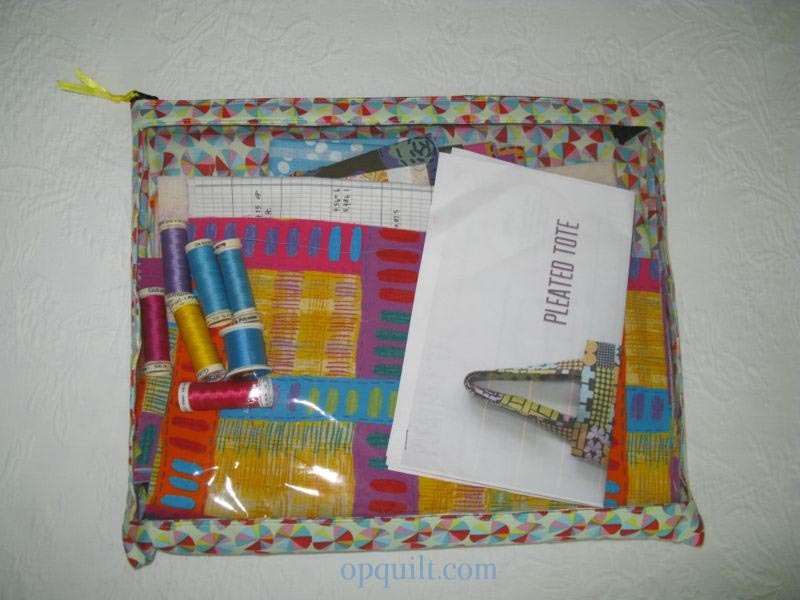 Given that it’s BIAS tape, it’s not going to ravel, but hey. Just thought it needed it. 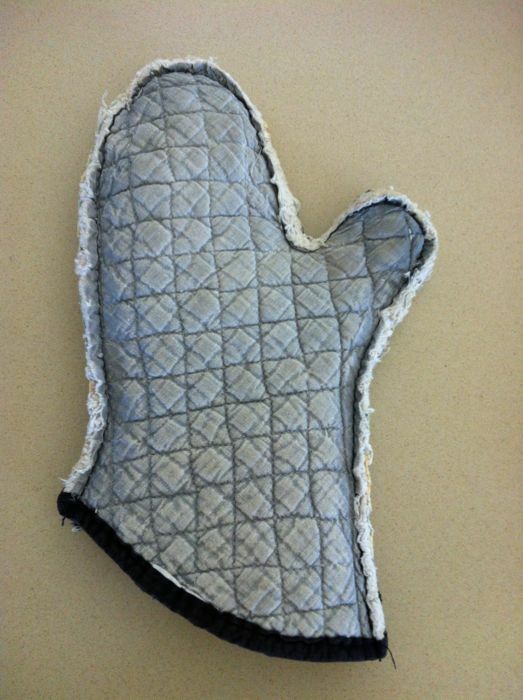 Flip your mitt right-side out, easing out the thumb and smoothing out the curve. 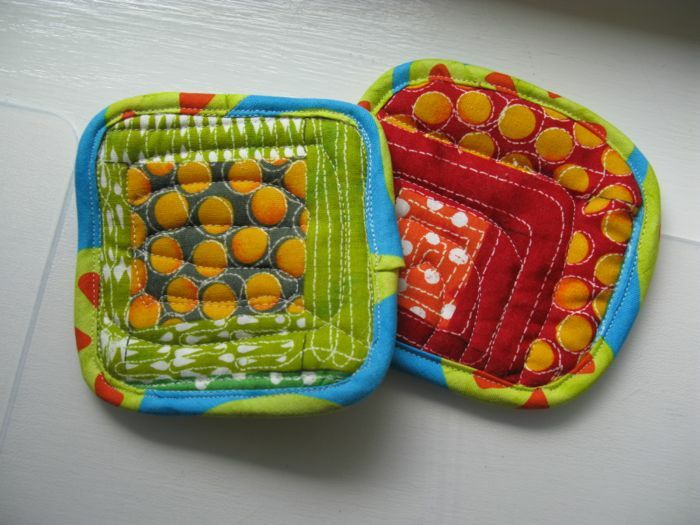 I cut some scraps into squares with rounded edges, and used the leftover bias tape to make a couple of coasters. Don’t examine my stitching, because like I said, it’s pretty obvious I went for sturdy over beauty. Okay, below are the patterns. Print them out and adjust your printer settings so the inch mark is true, then tape your two halves together. I scanned my pattern so it’s pretty true; I’m hoping you don’t have to do too much monkeying around. My hand size? 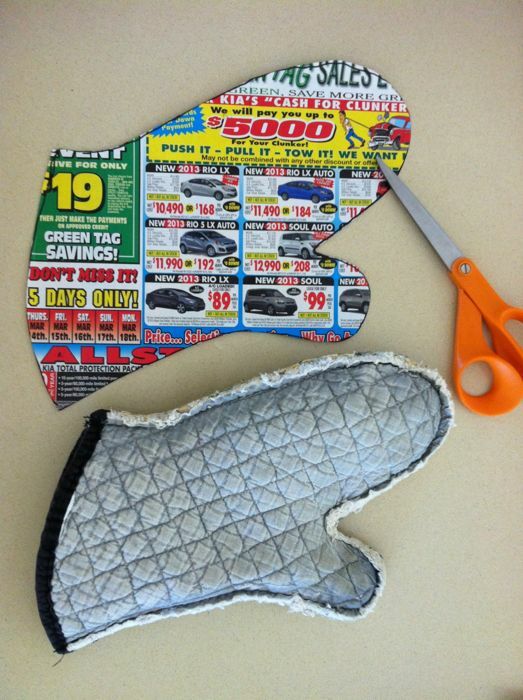 Medium in rubber gloves, so if yours is smaller or larger, use your copier/printed to enlarge or smallerize your pattern. 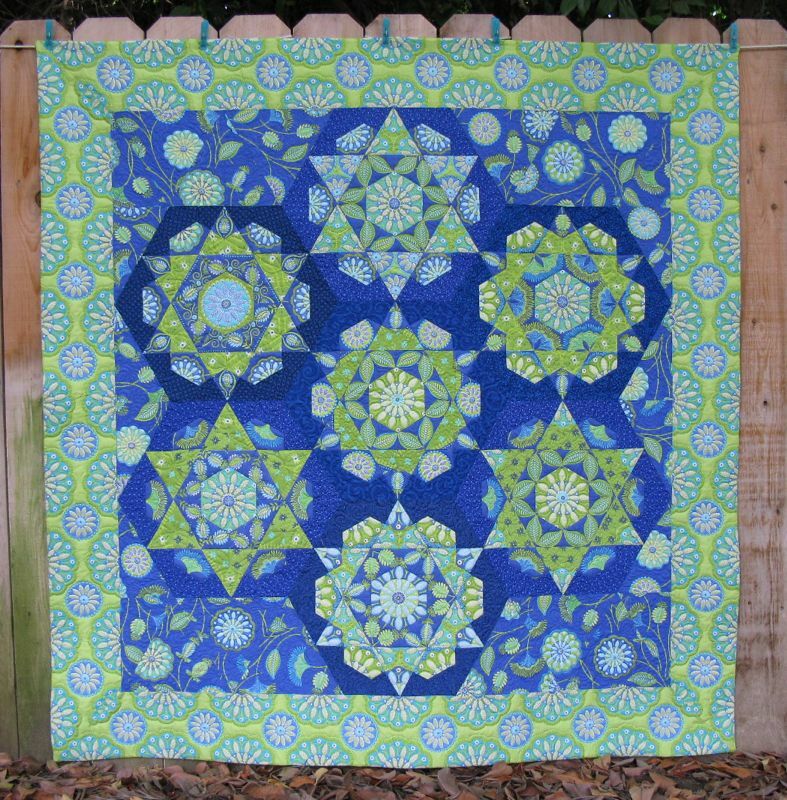 This is one of the projects on my Finish-A-Long list that I have completed, from Leanne’s Finish-A-Long!